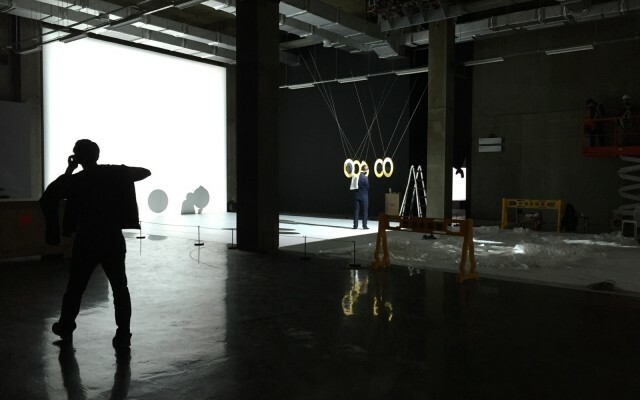 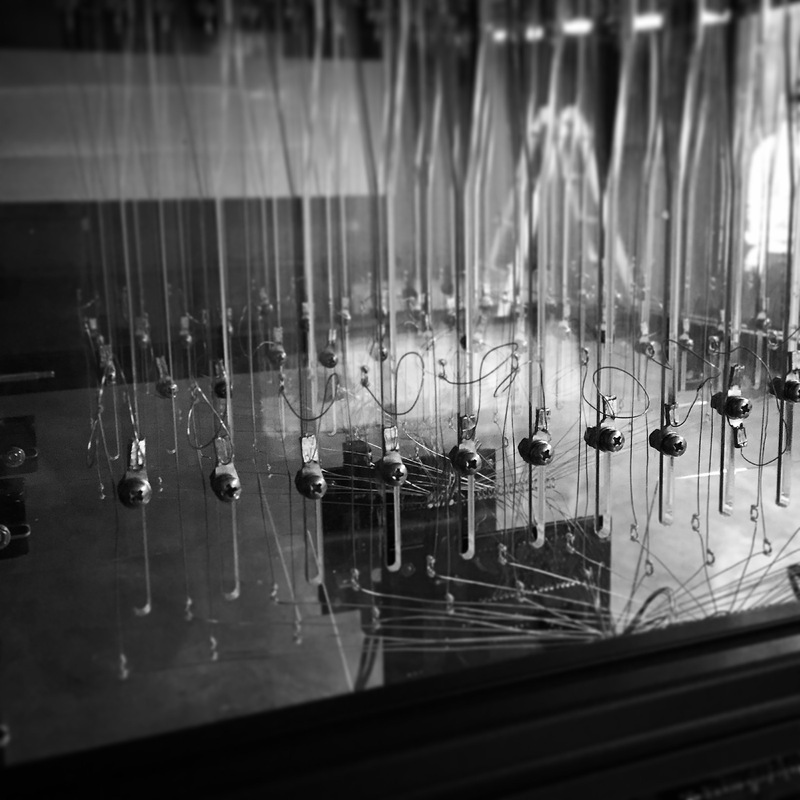 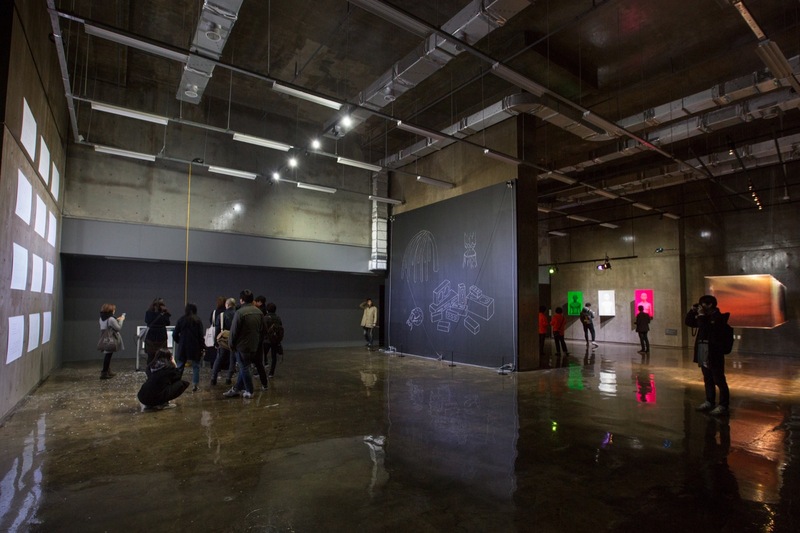 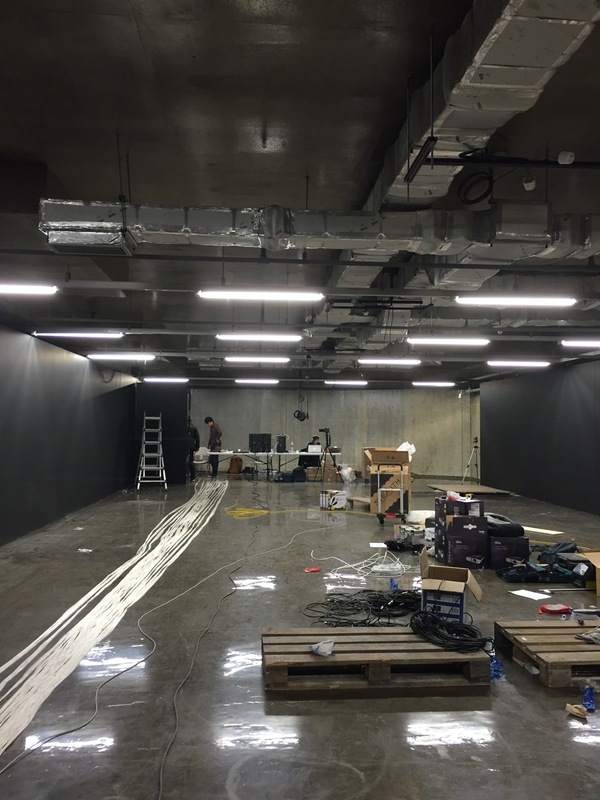 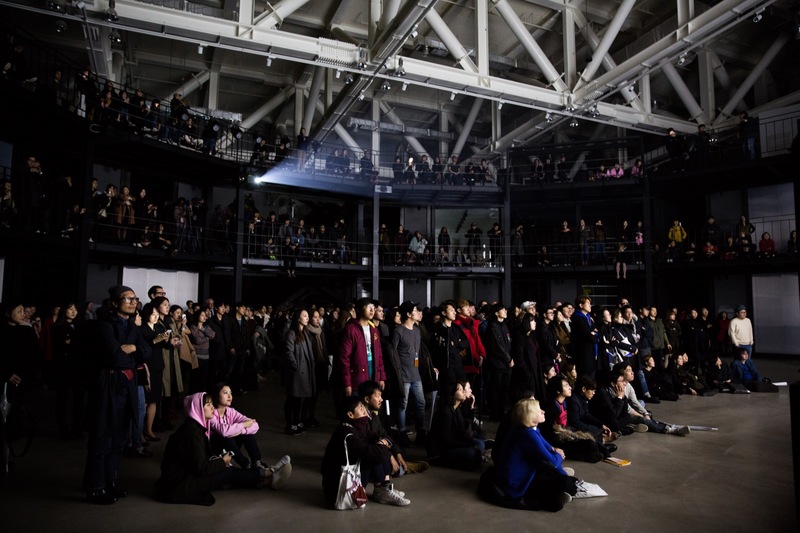 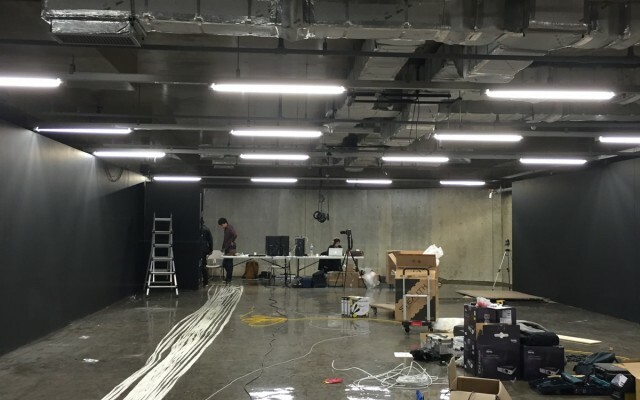 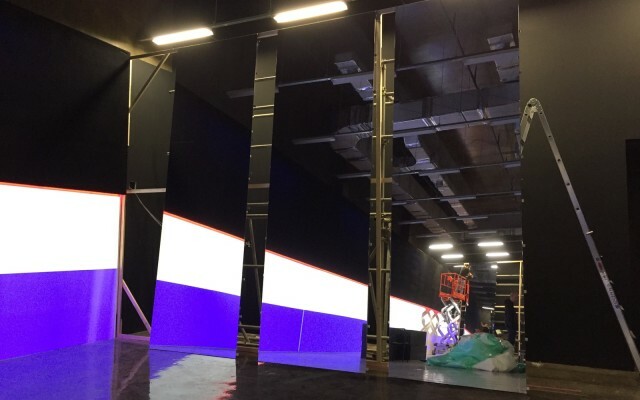 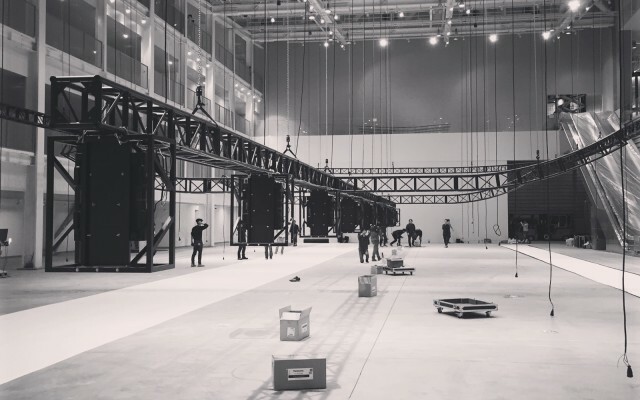 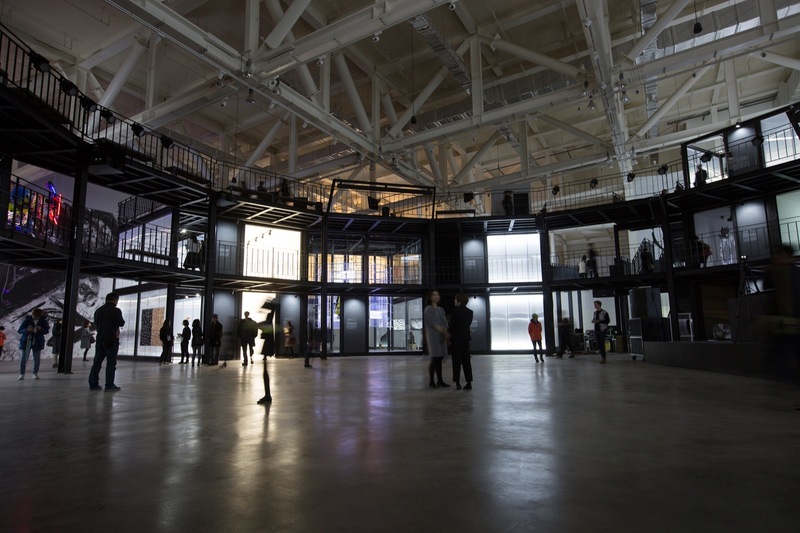 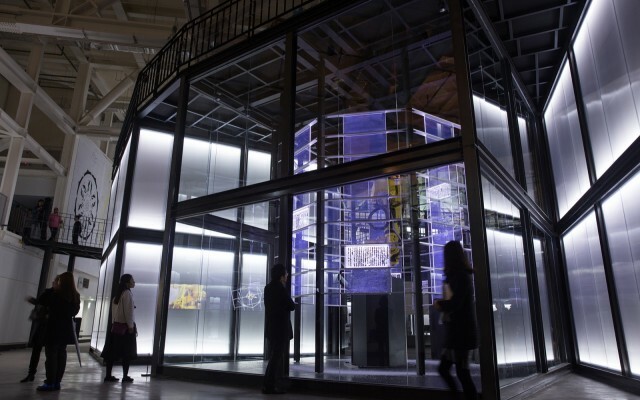 Huge stroboscopic datastreams, hypnotic human-machine choreographies, a cacophony of Korean, Japanese, English, German, and French – ten weeks ago, from November 25th to 28th 2015, an unlikely cross-cultural exchange took over the all new ACT Center in Gwangju, South Korea. 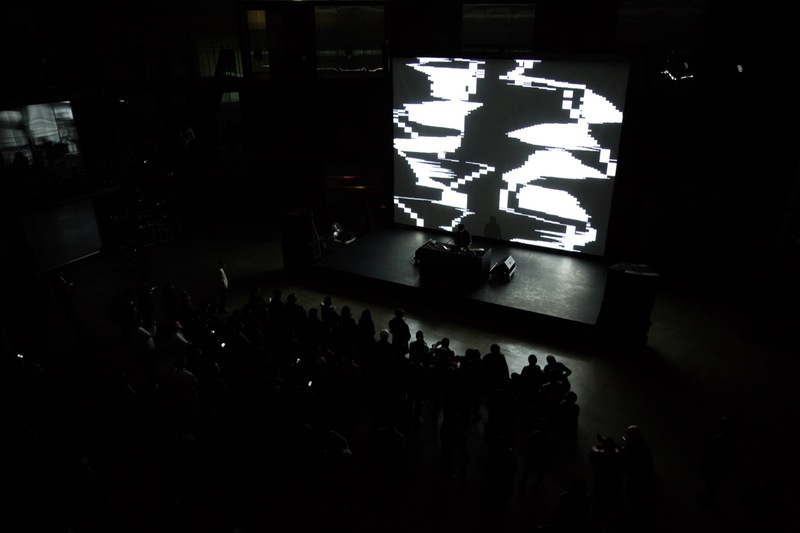 More than a hundred artists, designers, curators, and educators – local, regional, international – had answered our invitation to add their work and voice to the inaugural edition of ACT Festival, a four-day opening celebration of the center’s monumental facilities and the first of many programming highlights to come. 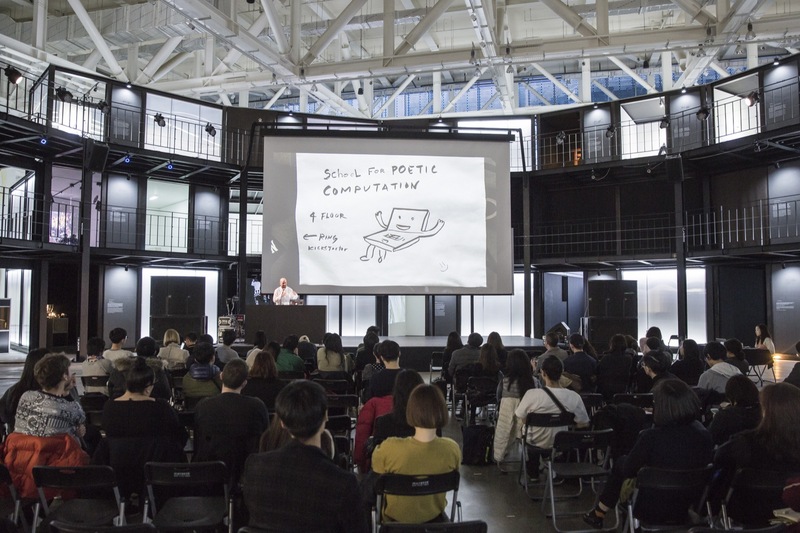 The goal: have the world’s best and brightest discuss the state of craft and creation in the digital age. 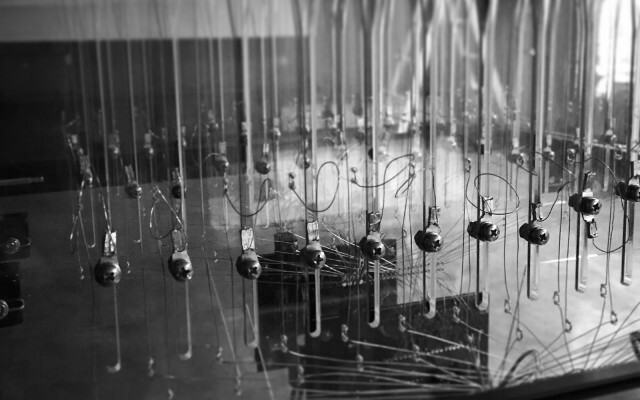 Loosely organized around the theme of ‘tektonics’ (from tektōn, the Ancient Greek noun for artisan/craftsman), ACT Festival was rife with opportunities to experience ‘new making’ first hand: an extensive exhibition landscape featured installations by Royoji Ikeda, ART+COM, Carsten Nicolai, Kimchi and Chips, LAb[au], Jürg Lehni and Alex Rich, Nobuhiro Nakashimi, exonemo, and Ralf Baecker across multiple spaces and rooms. 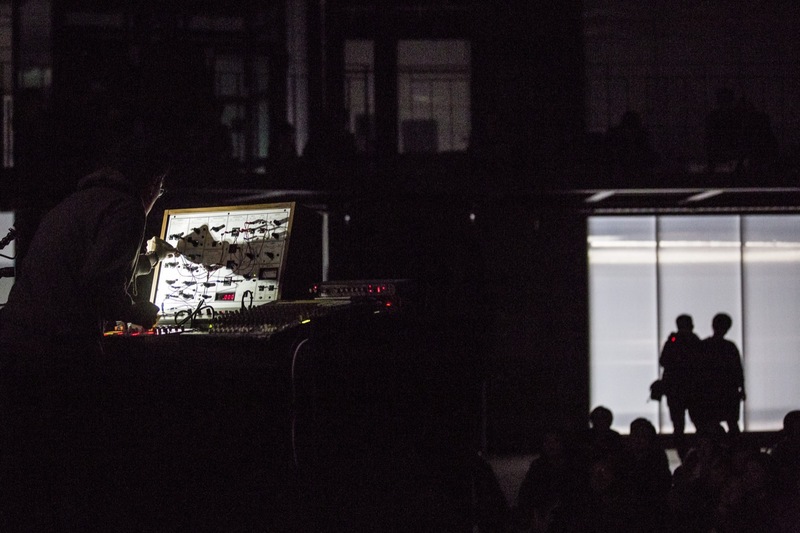 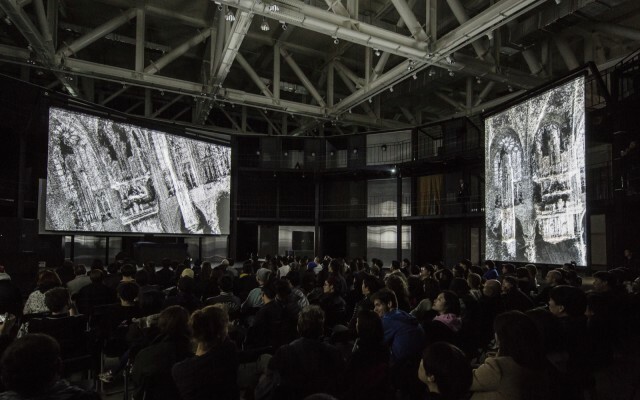 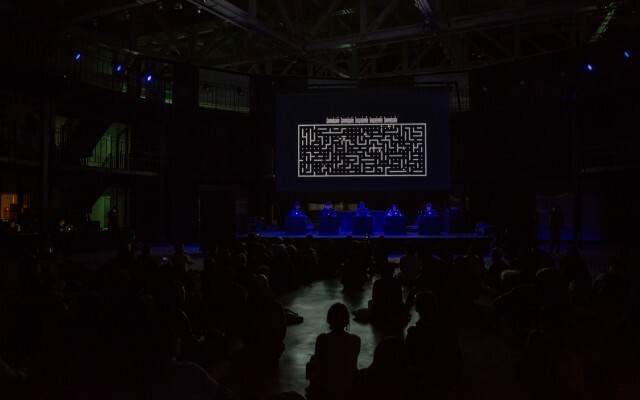 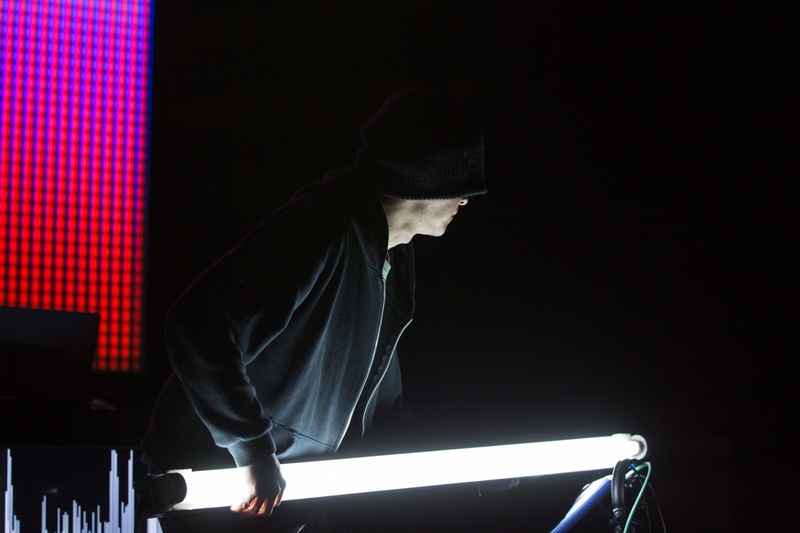 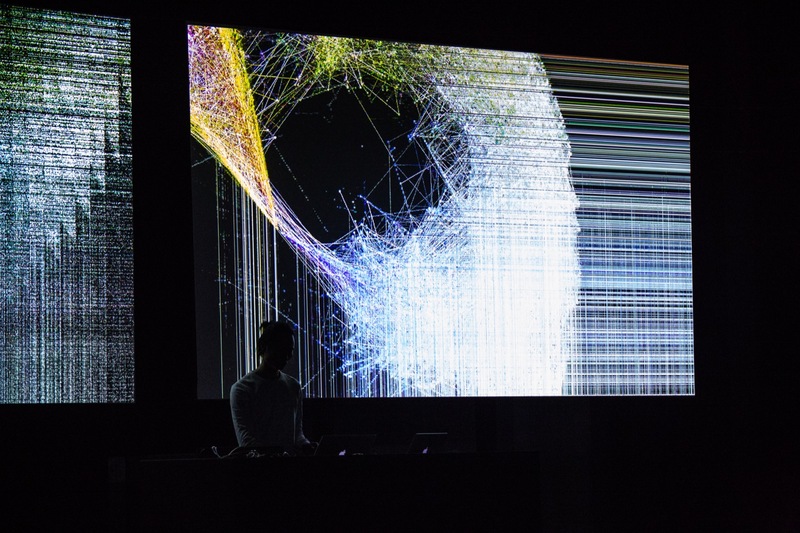 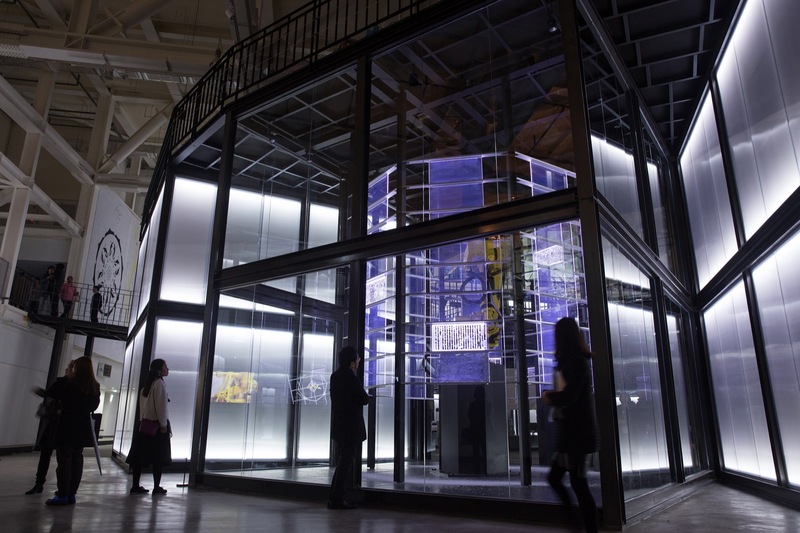 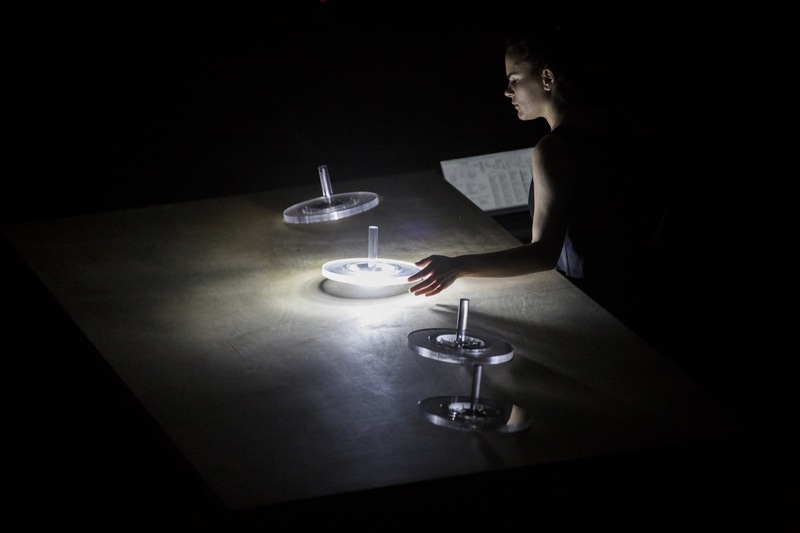 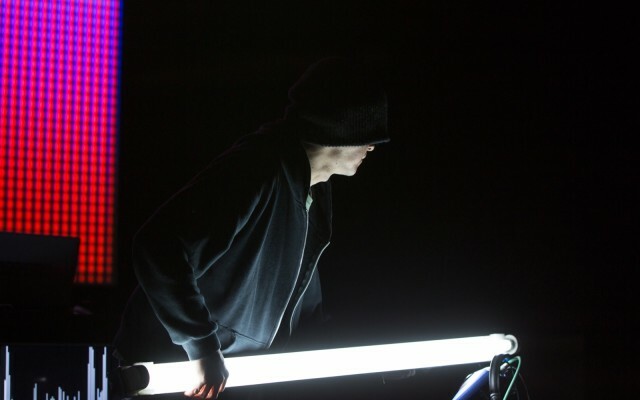 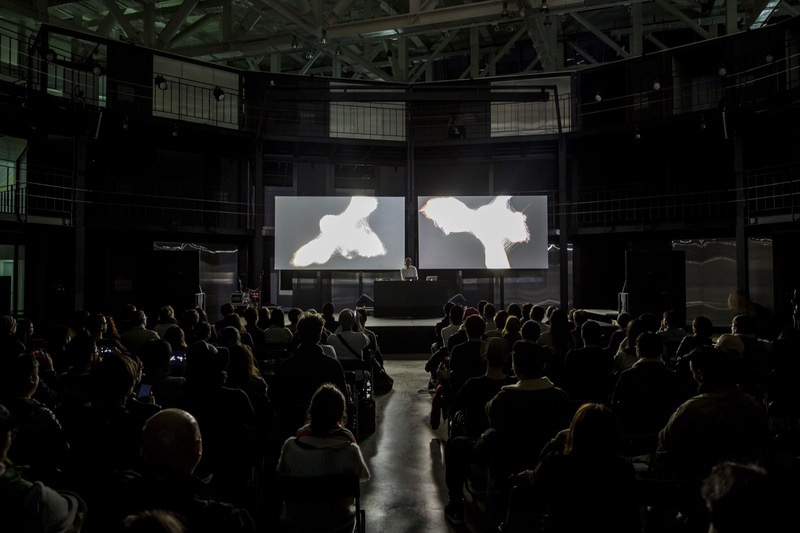 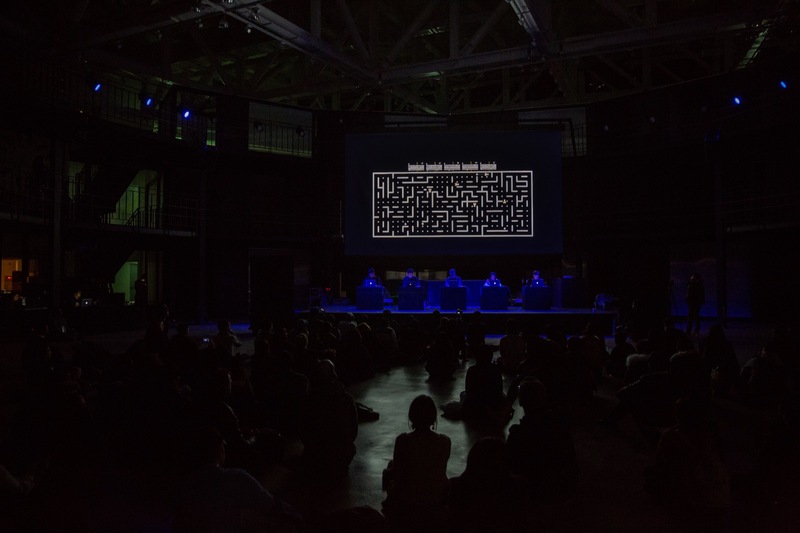 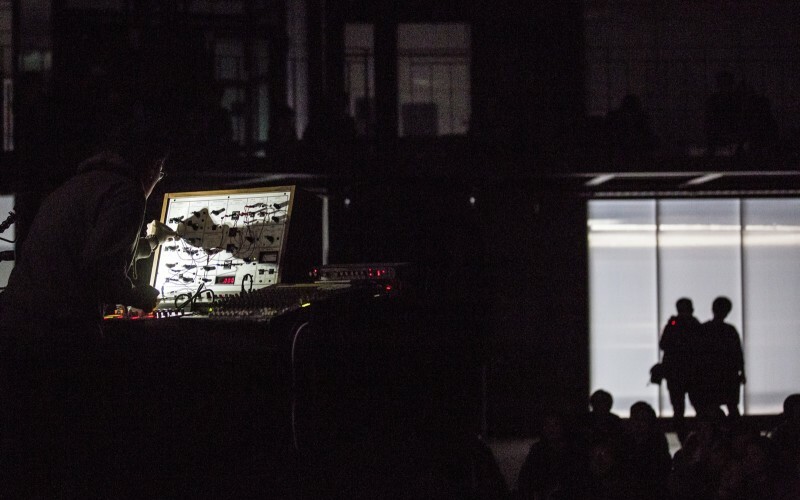 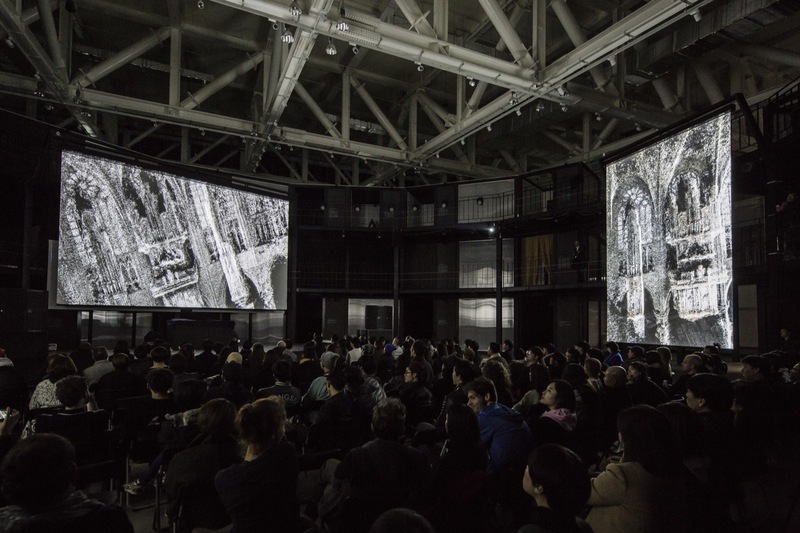 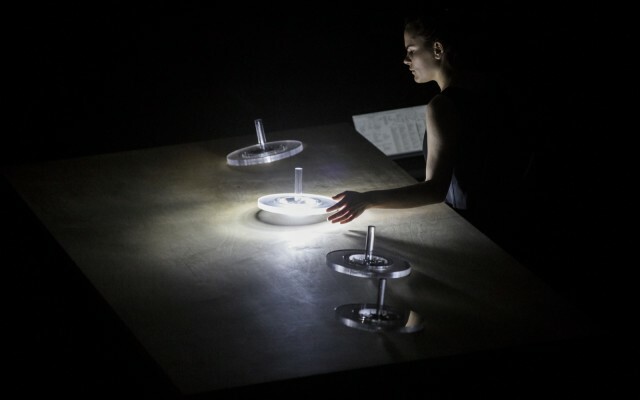 A series of nighttime performances had Diamond Version, Ryoichi Kurokawa, Rhizomatiks x ELEVENPLAY, Joanie Lemercier and others fuse image and sound live on stage. 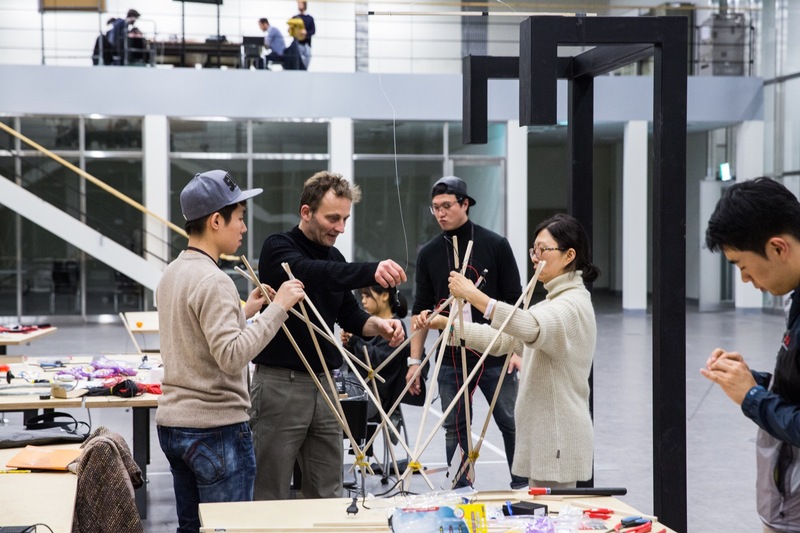 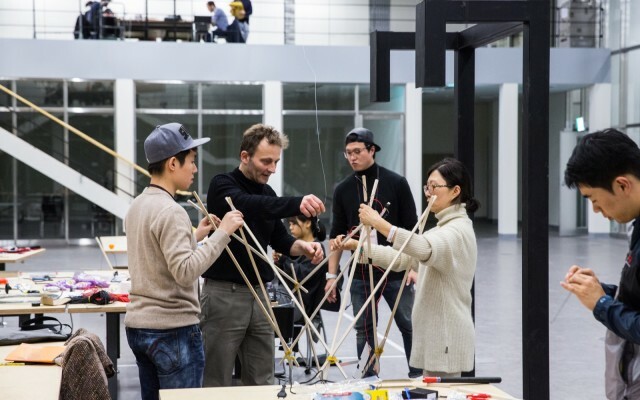 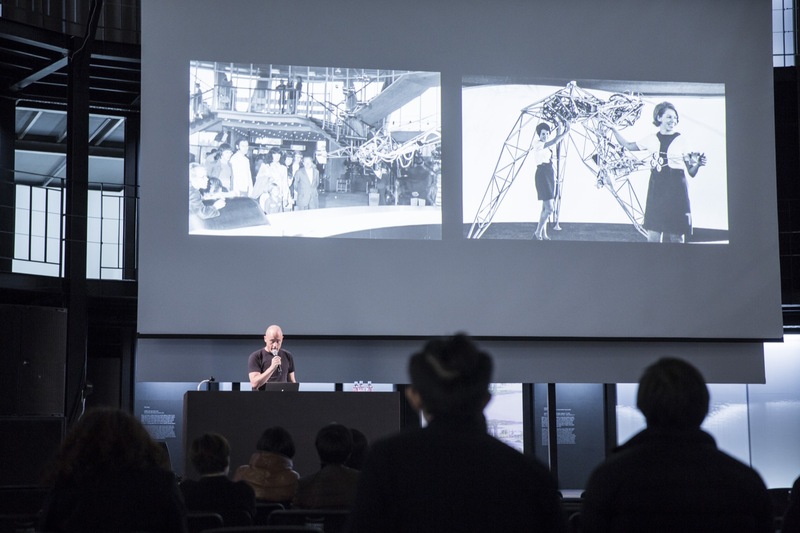 A total of seventeen workshops led by participating speakers and exhibiting artists such as Yuri Suzuki and Sam Conran, Taeyoon Choi, Ilona Gaynor, Manuel Abendroth and Els Vermang, and Chris Coleman had dozens of attendees build interactive sculptures, musical instruments, or experimental narratives. 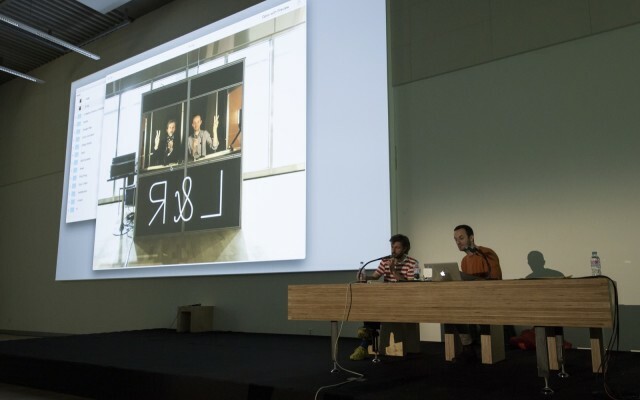 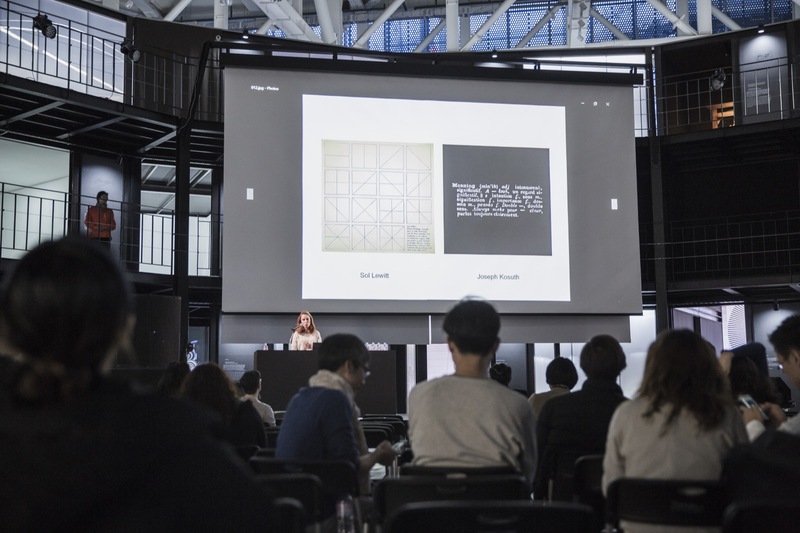 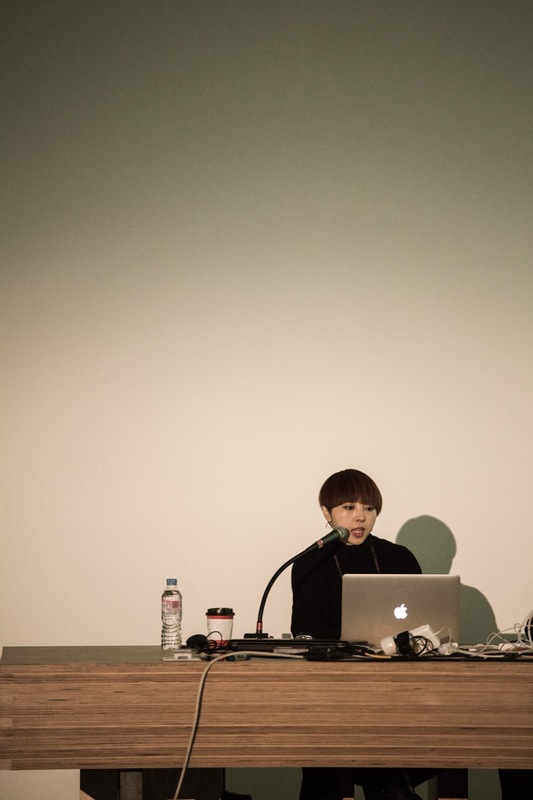 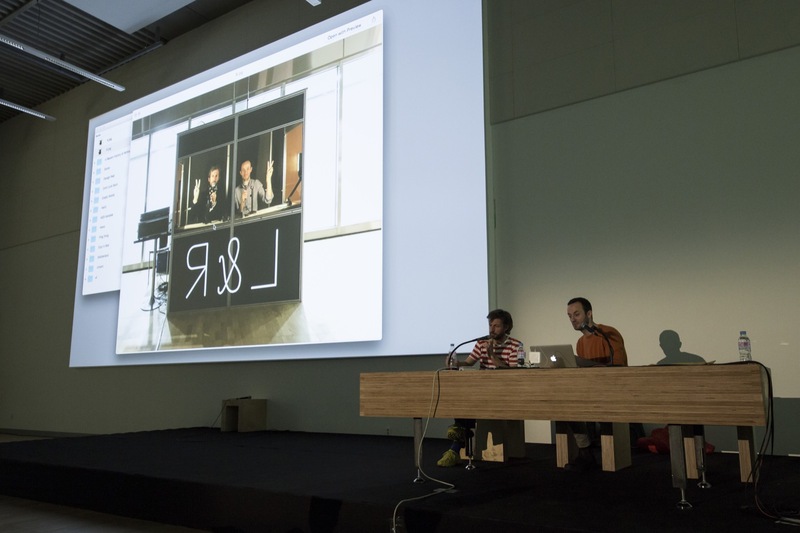 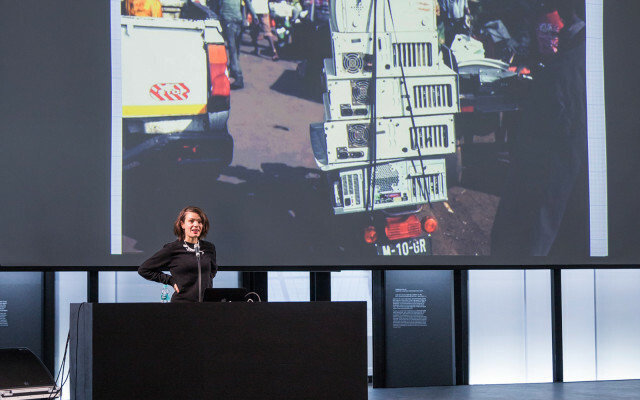 The heart and soul of the festival, however, was the symposium: over the course of 18 carefully curated sessions 75 luminaries such as Golan Levin, Matthew Clark (United Visual Artists), Régine Debatty, Karsten Schmidt, and Daito Manabe shared views on everything from ‘spatial arithmetic’ to ‘code, craft, methodology’ to ‘instruments of change’. 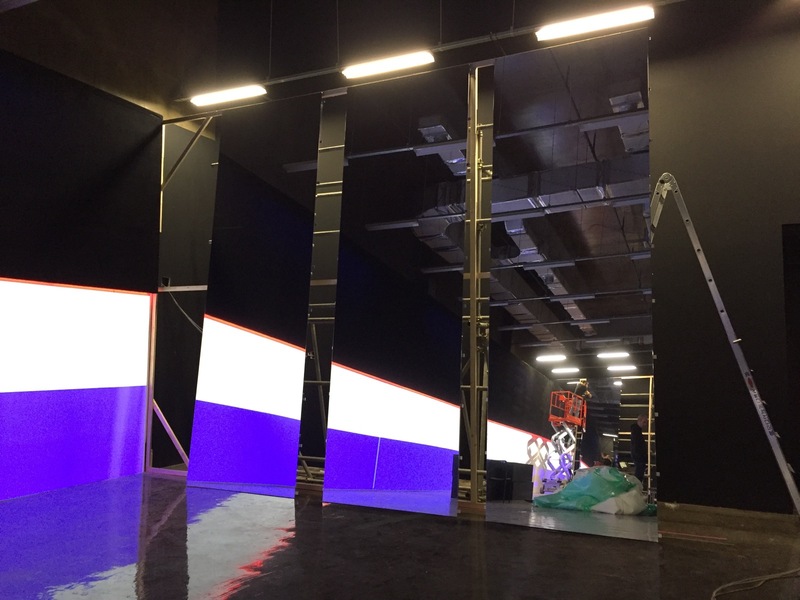 ↑ TL → BR: ART+COM studios, RGB|CMYK Kinetic, 2015 / Alex Rich & Jürg Lehni, The universe is made of stories, not of atoms, 2015 / exonemo, Body Paint (series), 2014 / Carsten Nicolai, unicolor, 2014 / Nobuhiro Nakanishi, Layer Drawing – the Tactual Sky, 2013 / LAb[au], mosaique 4x4x4 rgb, 2013. 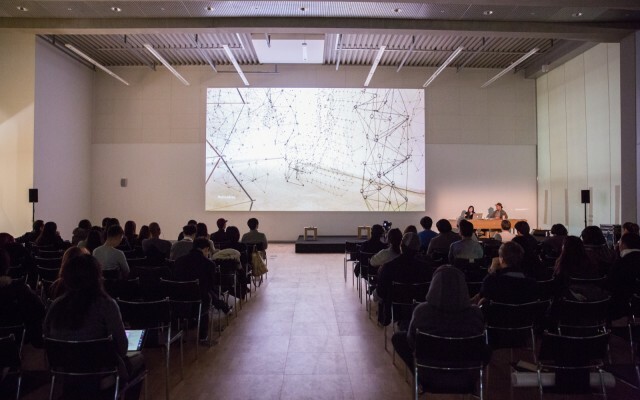 Varying perspectives yield productive friction: To kick off our conversation, we turned to a trio of practitioners who have spent their careers at the frontline of interdisciplinary practice. 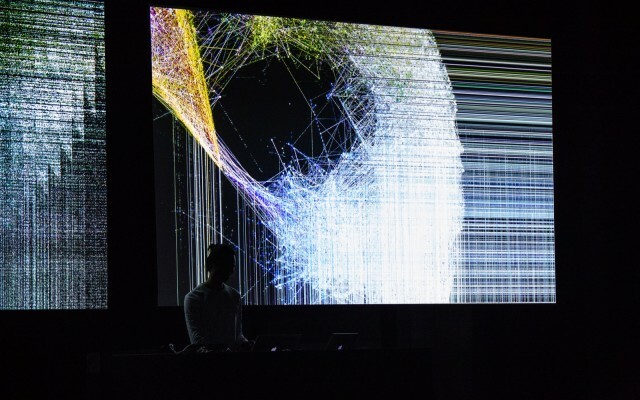 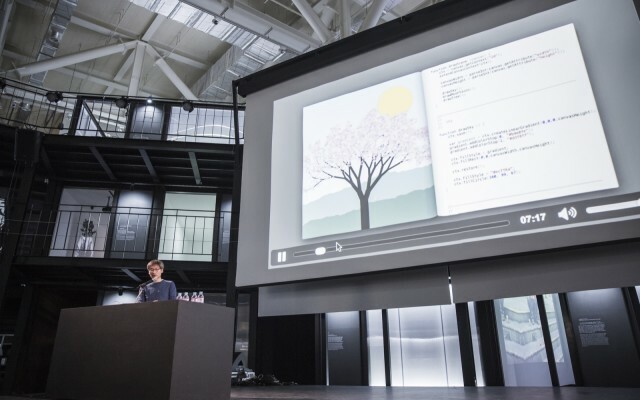 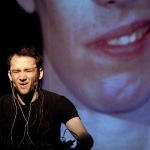 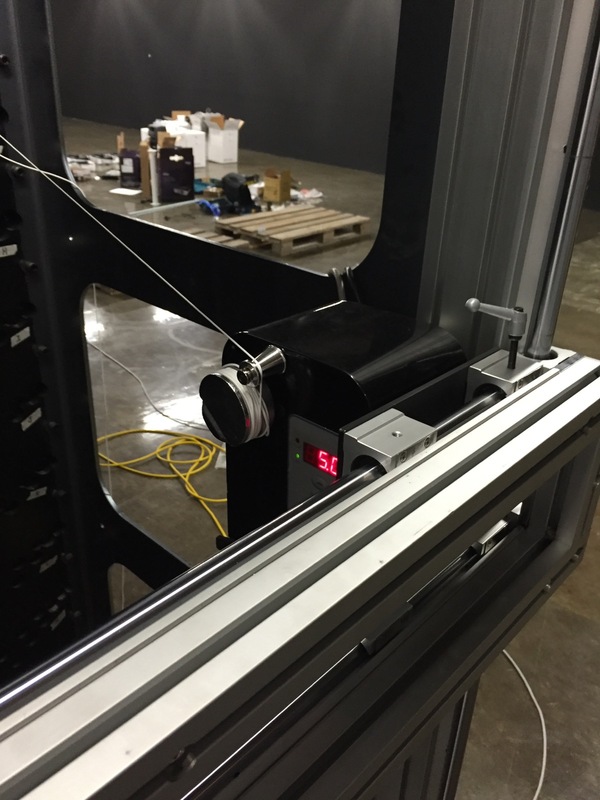 Artist and educator Zach Lieberman, We Make Money Not Art’s Régine Debatty, and the purveyor of the digital sublime Ryoji Ikeda all summarized their work and interests. 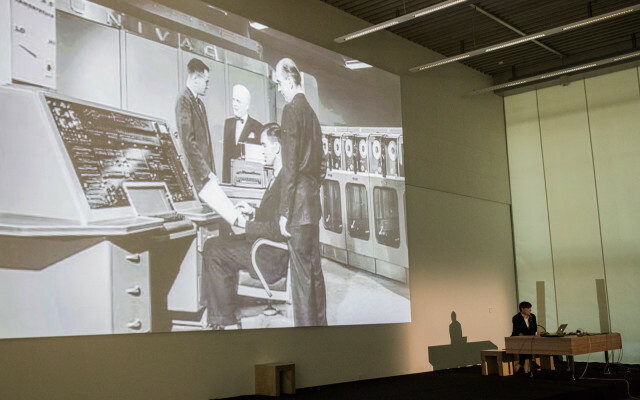 The challenges and rewards of subverting postsecondary education profiteering, the cold hard truths about the geological and sociopolitical underpinnings of our tech-infused lifestyle, and war stories from a life spent perfecting a singular aesthetic – their divergent perspectives and priorities captured the breadth of the broad ‘spectrum’ of ACT Festival’s participants. 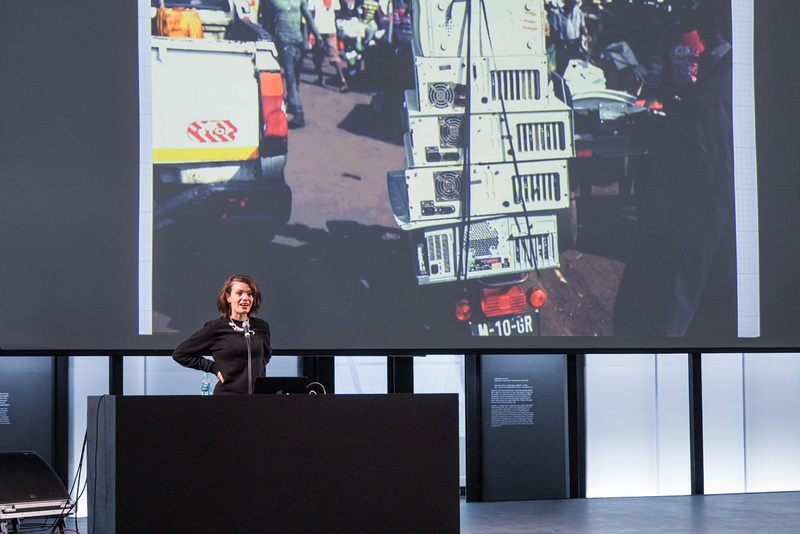 Régine Debatty discusses Agbogbloshie, the massive e-waste dumping ground in Ghana where many of the world’s electronics end up. 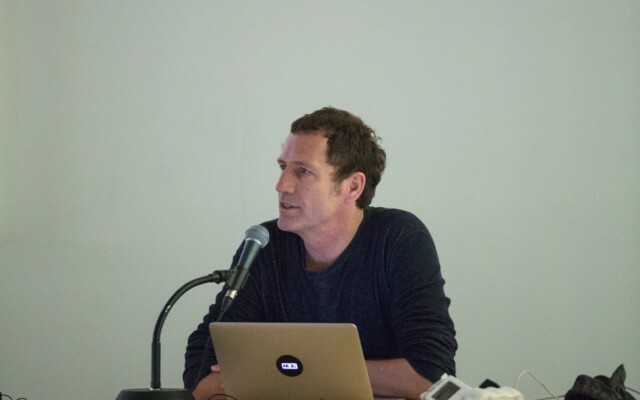 Zach Lieberman outlines some of the thinking that underpins the School for Poetic Computation’s radical rethinking of postsecondary education. 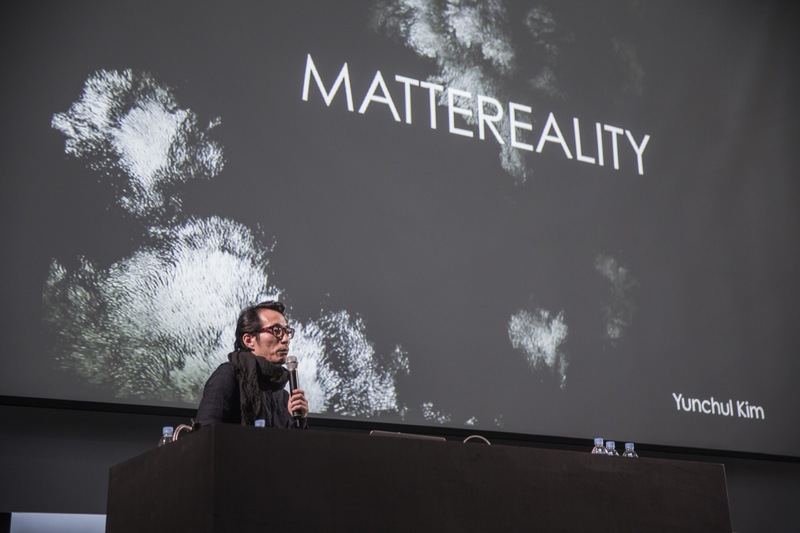 Installation artists don’t just work spatially, they engineer perception: Within the forum, a session on ‘spatial arithmetic brought together projection artist Joanie Lemercier, Mimi Son and Elliot Woods of Kimchi and Chips, and ART+COM’s Joachim Sauter to discuss methodologies for manipulating light, sound, space, and material within installations. 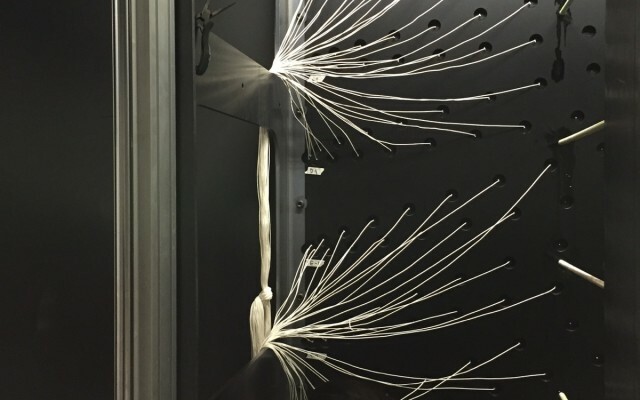 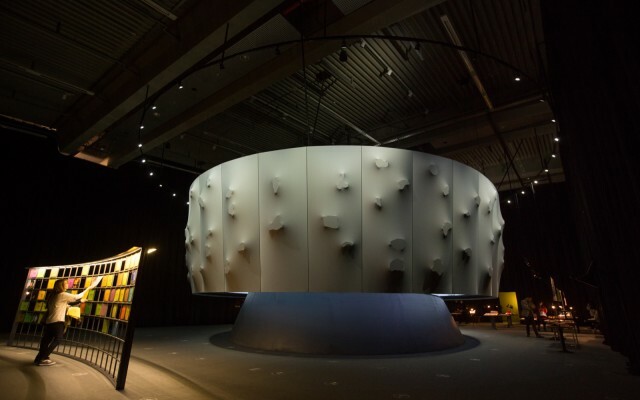 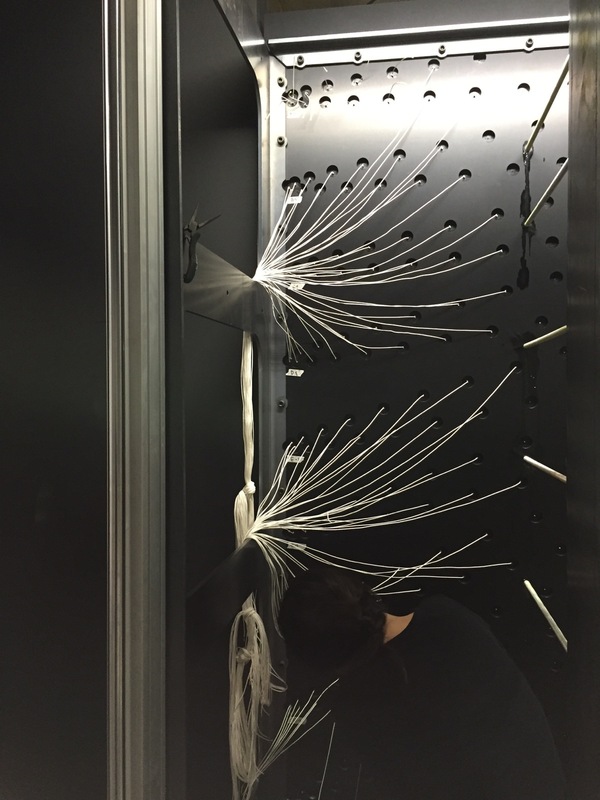 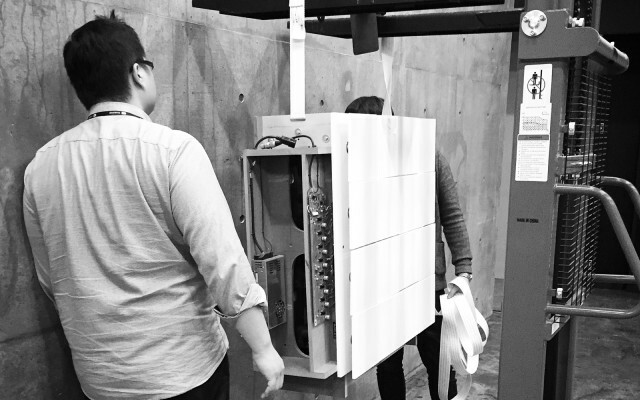 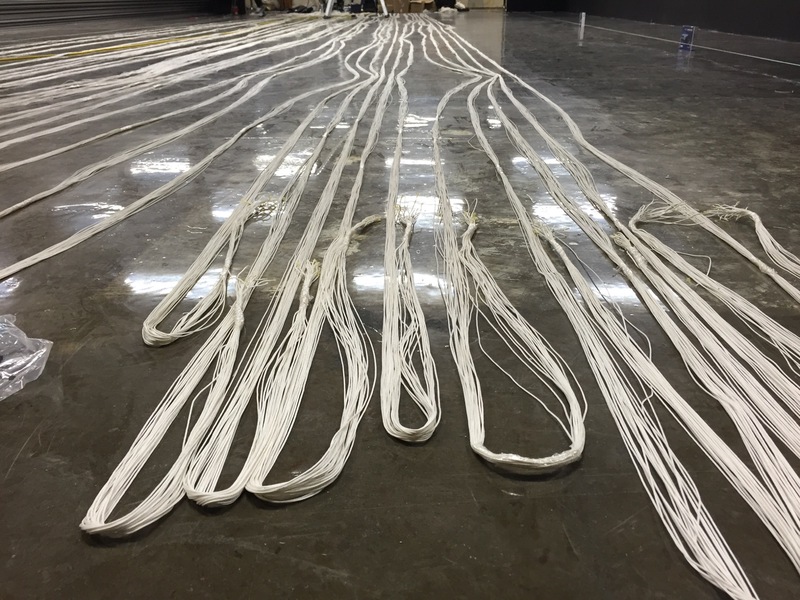 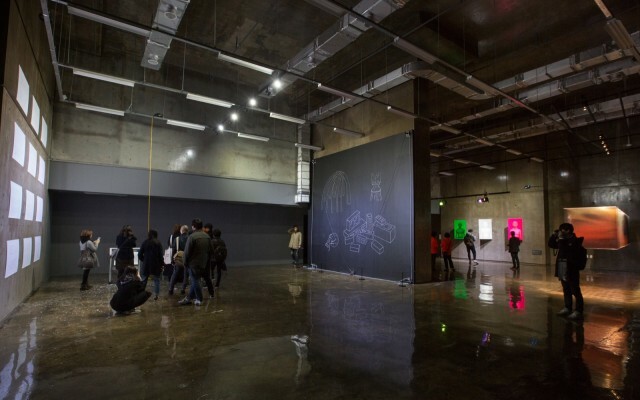 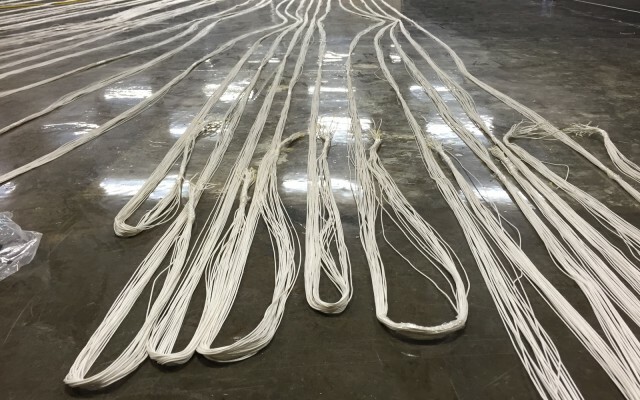 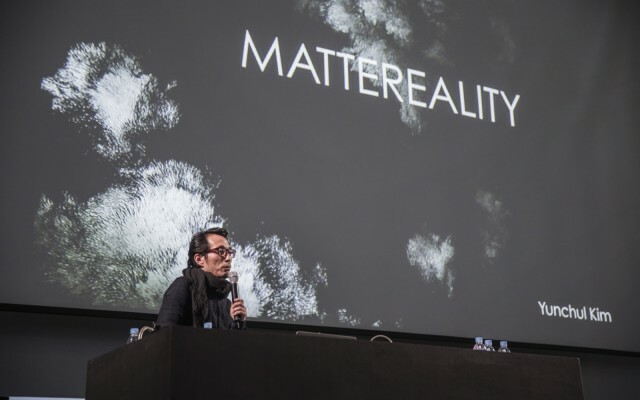 This conversation was a treat to listen to and it revealed many details about how multisensory experiences are engineered, adding considerable nuance to attendees’ appreciation of the seemingly seamless works in ACT Festival’s flagship exhibition. 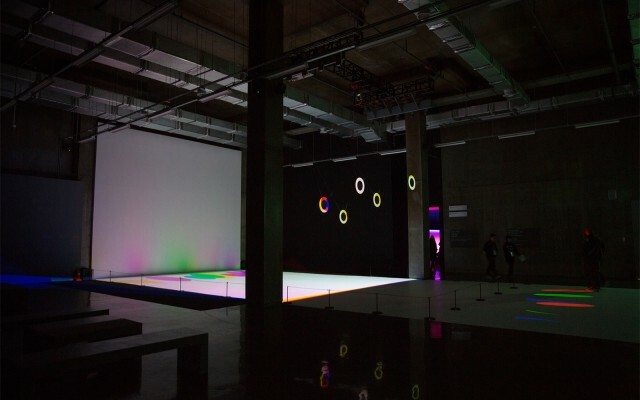 ART+COM’s RGB|CMYK Kinetic and Carsten Nicolai’s unicolor both offered contemplative spaces for soaking up the colour spectrum but were distinct in tone and effect. 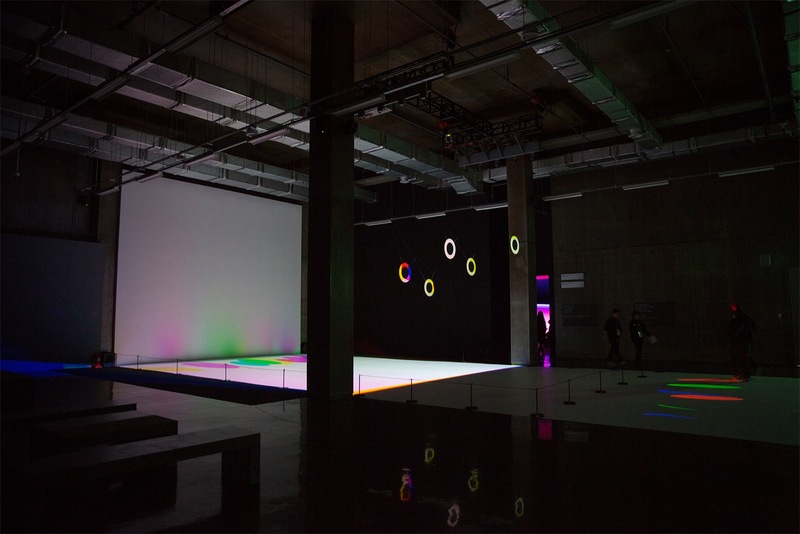 The former utilized an array of suspended metal discs that whirred around in a machine choreography casting hued-reflections onto the floor, while the latter presented a panoramic reflected view of colour modules that – thanks to a pair of mirrors bookending its projection surface – expanded into infinity. 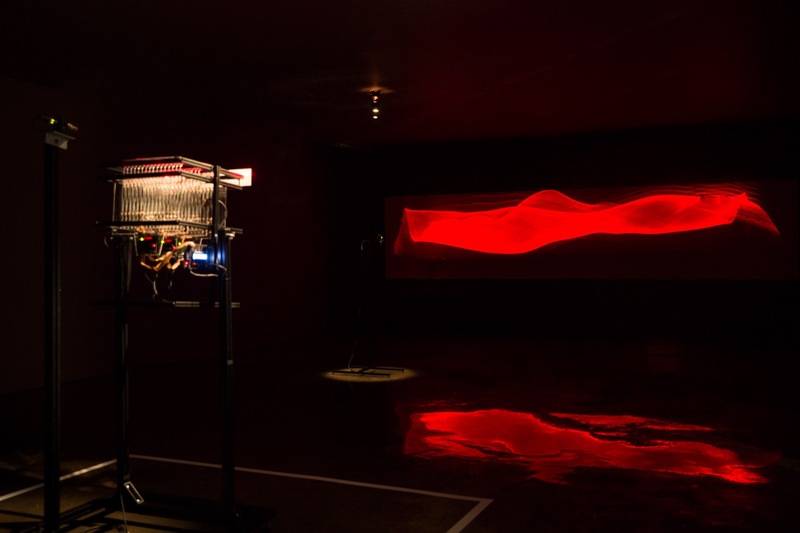 Other ‘linear’ views were on display: Kimchi and Chips 483 Lines Second Edition precision mapped two dense sixteen-metre spans of nylon threads in a delicate flickering homage to the NTSC broadcast standard while Ralf Baecker’s Mirage deployed an elaborate optical apparatus that manipulated a mirror sheet based on fluctuations in the Earth’s magnetic field, off which an illusionary landscape-like form was reflected onto a far wall. 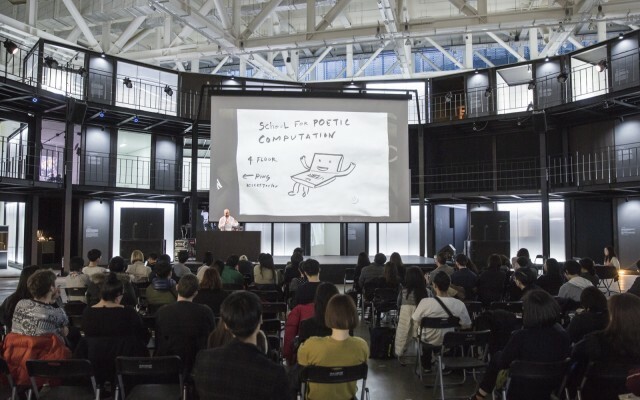 Creators are setting up shop in labs: Residency programs are all the rage right now so those that distinguish themselves in context, scope, or ambition are the ones that deserve the most attention. 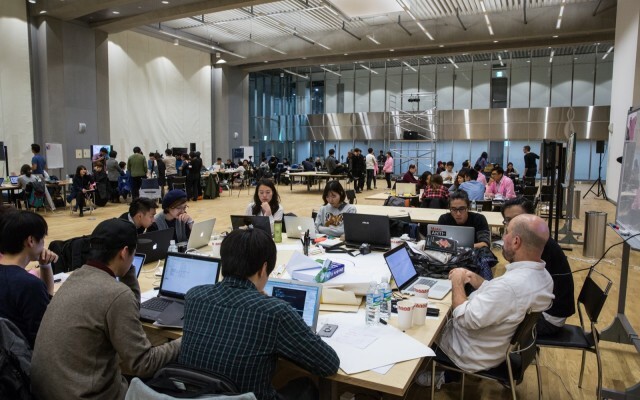 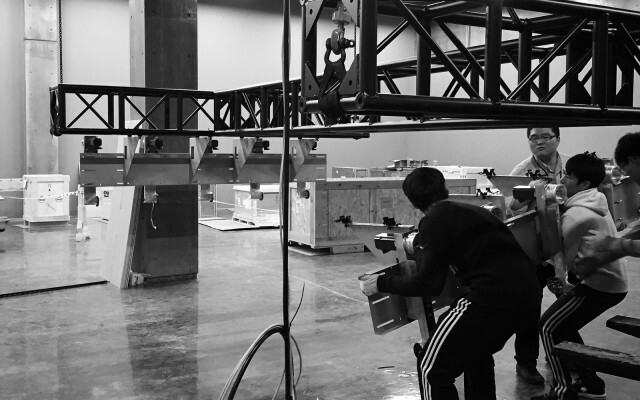 We excitedly announced the ACT Center’s call for submissions for its ‘Creators in Lab’ initiative last July, as we felt its impressive facilities and generous financial support was sure to foster strong work. 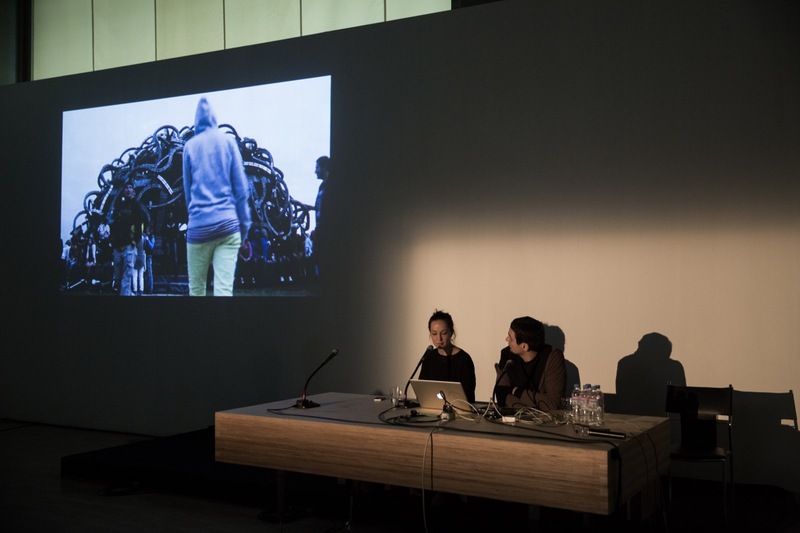 The first ‘Creators in Lab’ residents were present at ACT festival and they provided some glimpses at their promising work-in-progress. 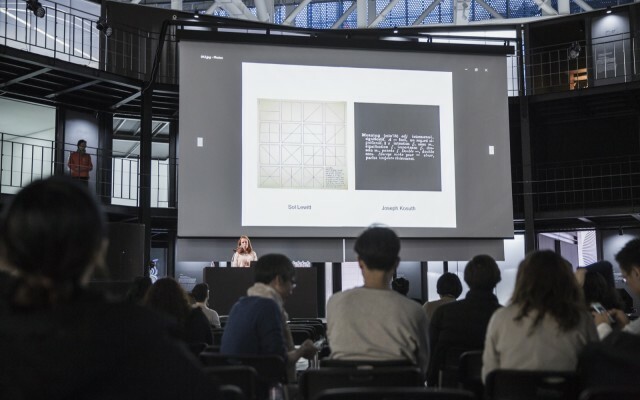 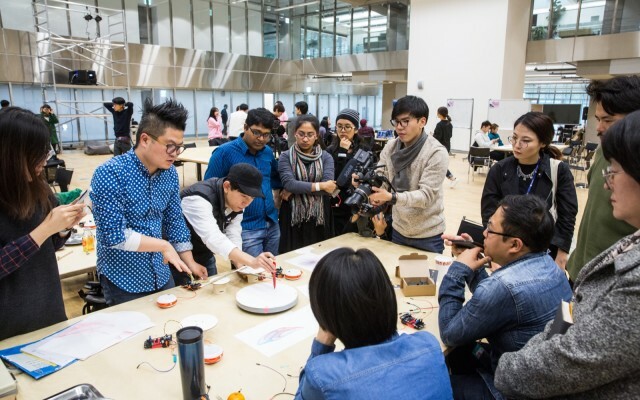 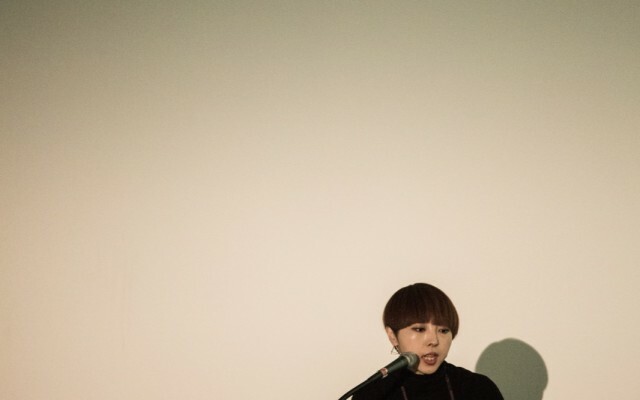 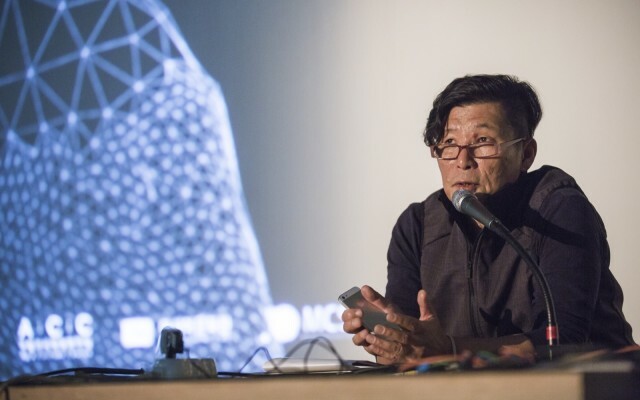 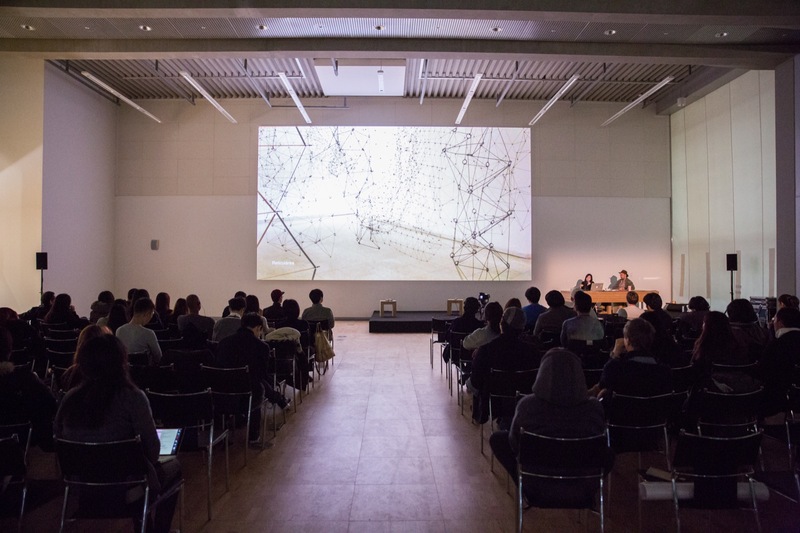 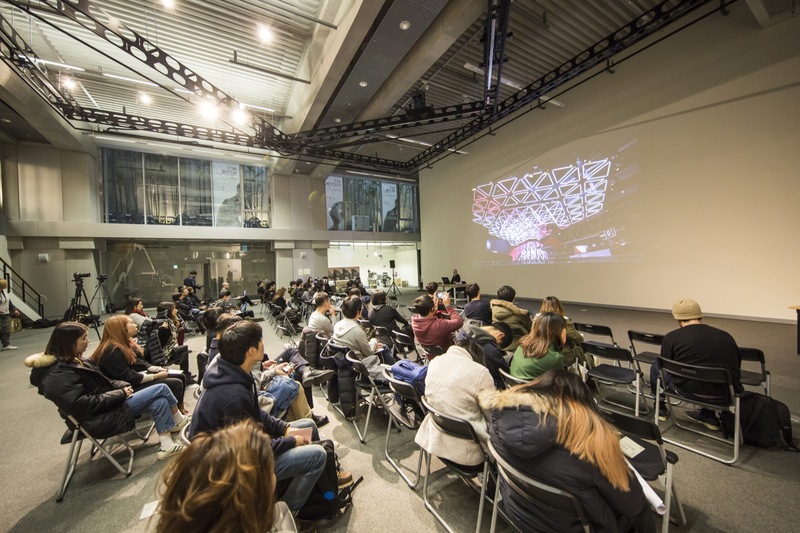 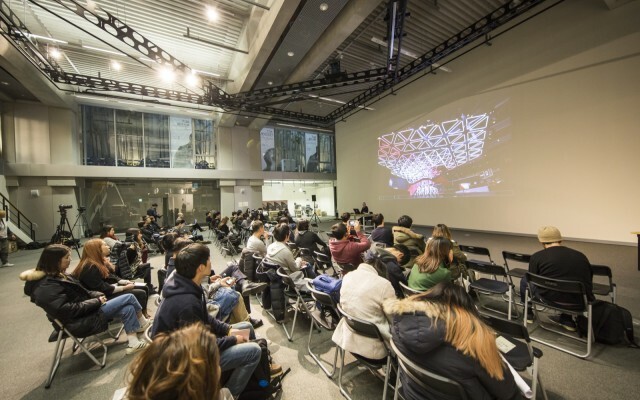 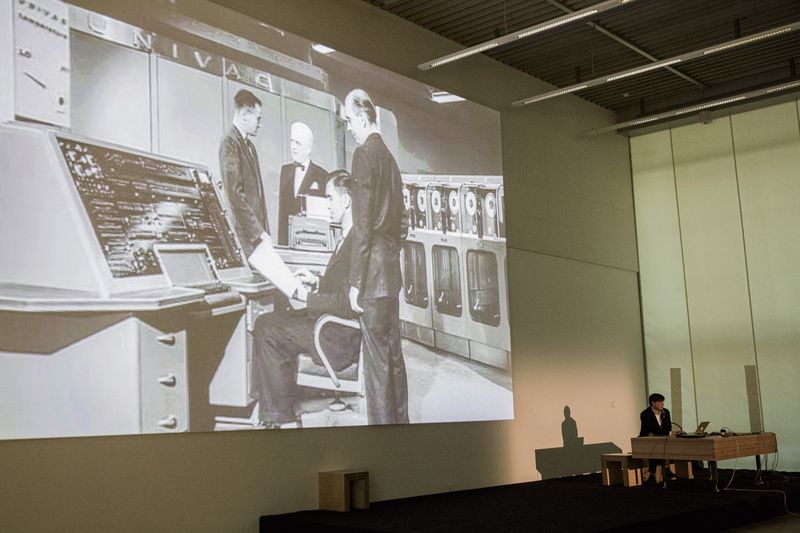 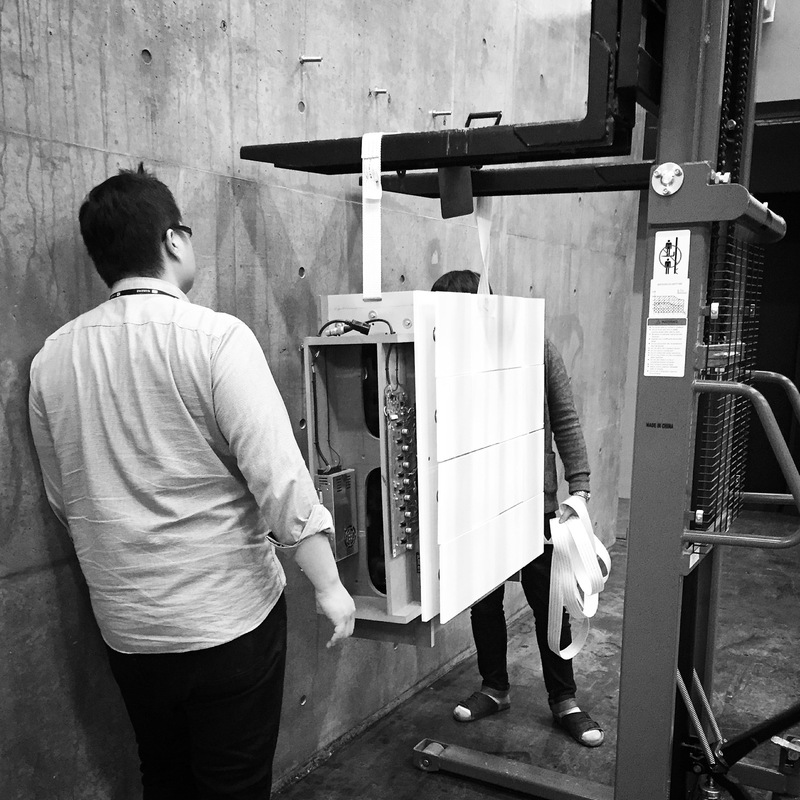 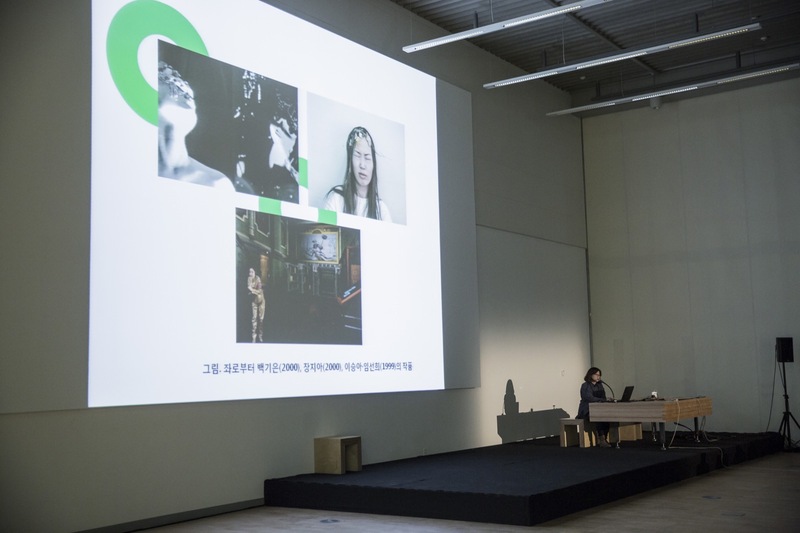 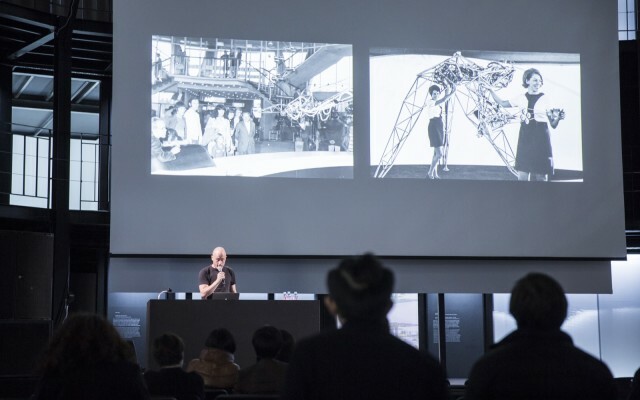 Amongst those sharing projects and insight were the electroacoustic musician and installation artist Yunchul Kim, self described historical “re-enactor” and installation artist Sascha Pohle, and the media artist Ye Seung Lee. 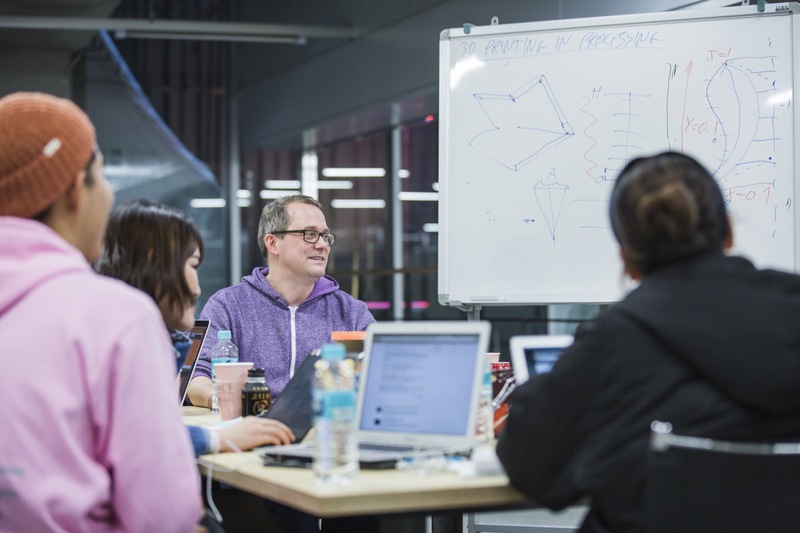 With residence programs there are two sides to the coin: occupants and hosts. 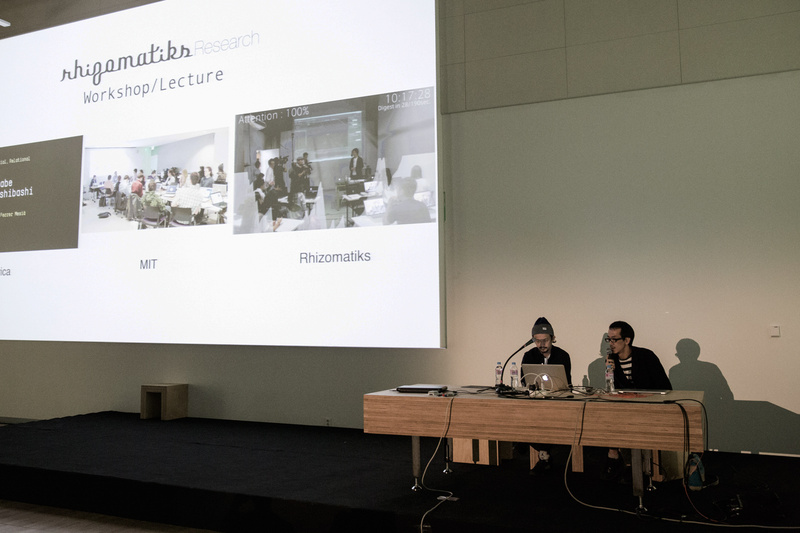 Speaking quite expertly on the latter role, we were thrilled to hear Golan Levin dedicate a portion of his talk to discussing his work directing the Frank-Ratchye STUDIO for Creative Inquiry at Carnegie Mellon, where he helps cultivate “atypical, anti-disciplinary, and inter-institutional research projects.” Channeling a range of perspectives from Leah Buechley to John Maeda, Levin outlined how his lab works between disciplines, courts courageous explorations of emerging technology, and strives to catalyze a few “shots from the outside” – like only artists can deliver. 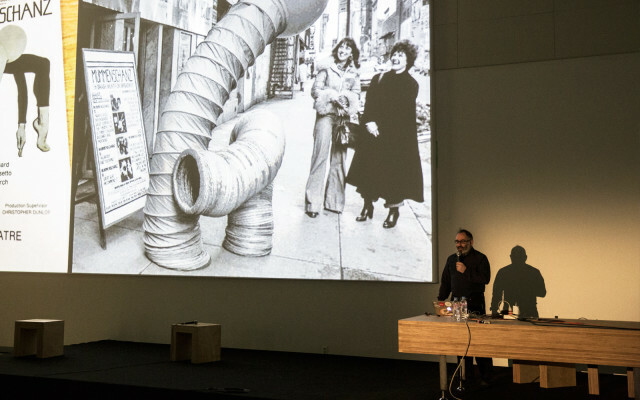 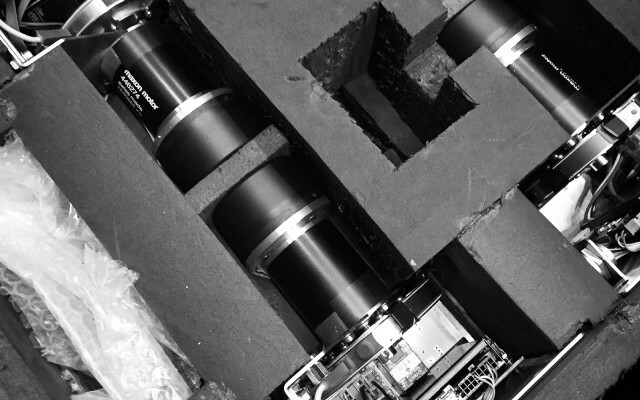 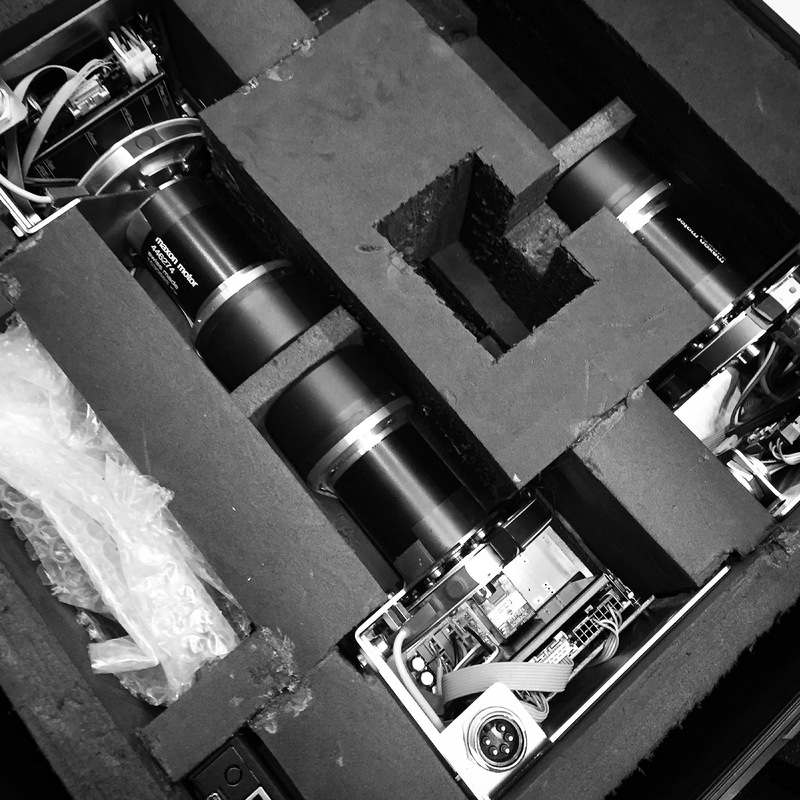 Golan Levin discusses the Swiss theatre troup Mummenschanz, who inspired his playful Double-Taker (Snout) robotics project. 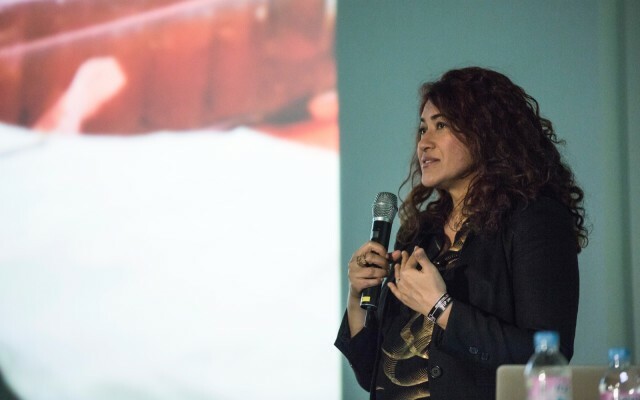 Laleh Mehran on Eastern and Western philosophies and aesthetic sensibilities that are a source of inspiration in her artwork. 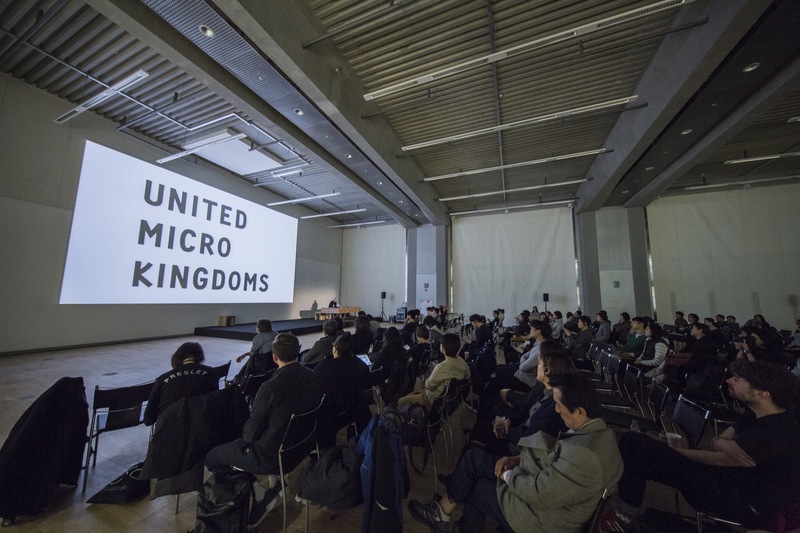 The notion of ‘craft’ in the twenty-first century is only beginning to come into focus: William Morris’ adage about there being no art “without resistance in the material” was on our mind heading into ACT, and we dedicated a portion of the programming to help figure out how that nineteenth-century thinking about the design of furniture and decorative objects translates into a milieu where software and hardware intersect, and digital fabrication is evolving rapidly. 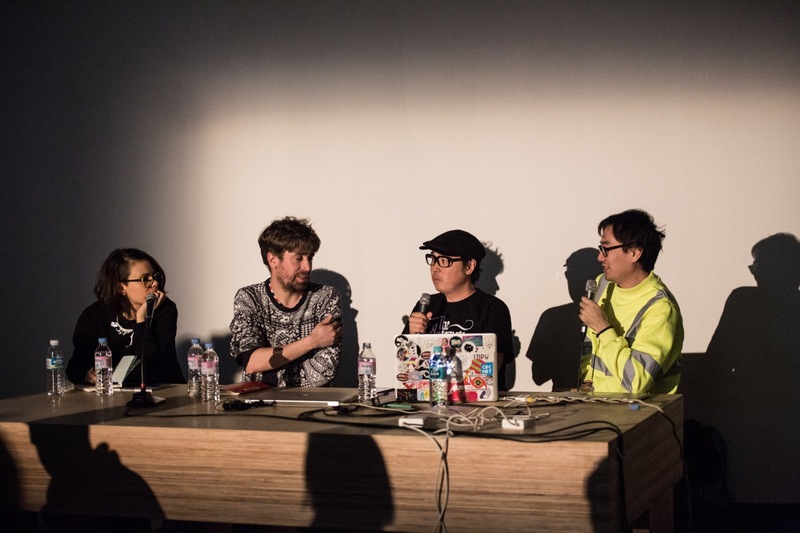 The Code, Craft, Methodology session brought SeungBum Kim and Hoonida Kim of Protoroom, and computational artists Karsten Schmidt and Marius Watz together to discuss how computation has become a medium unto itself. 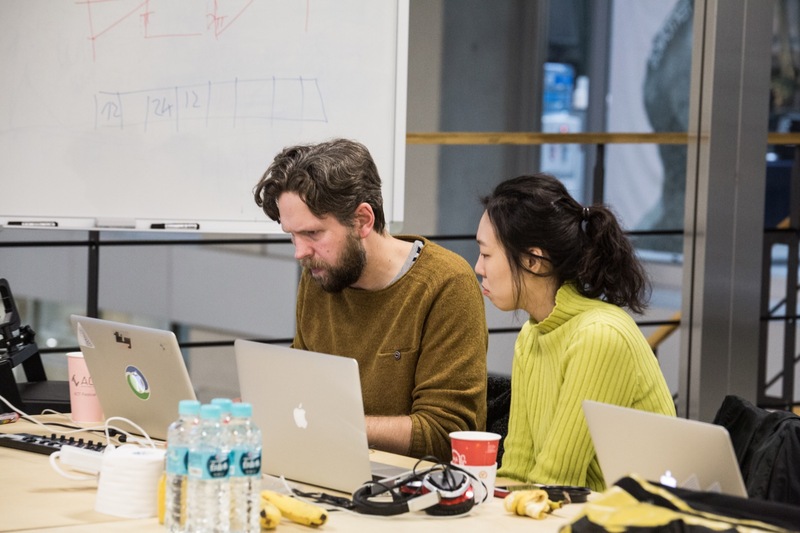 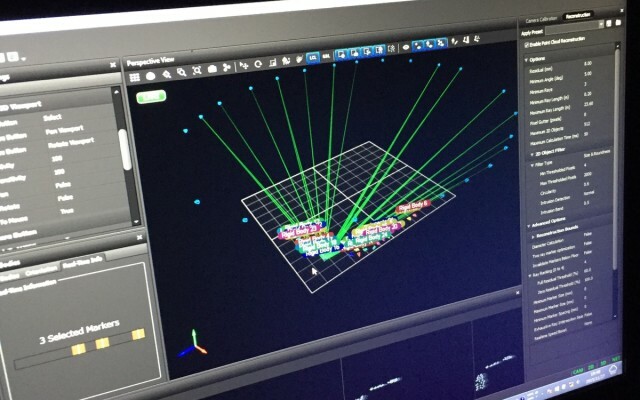 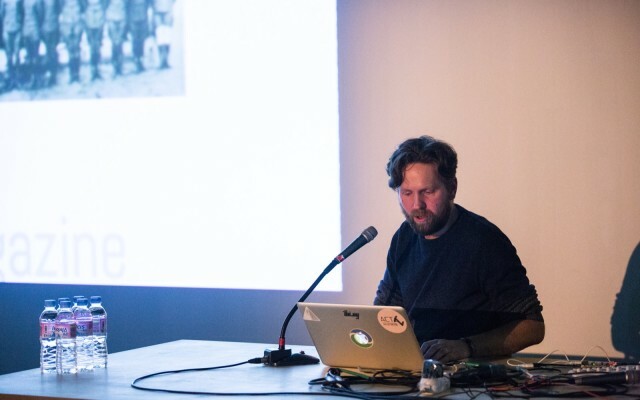 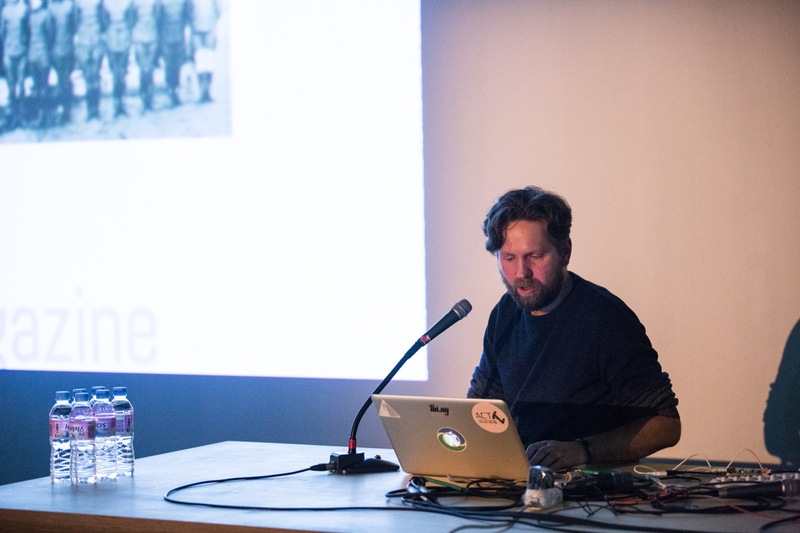 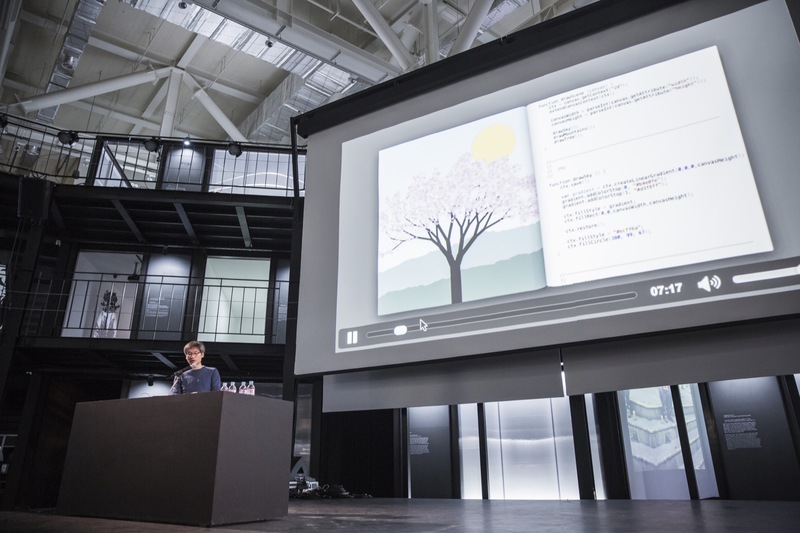 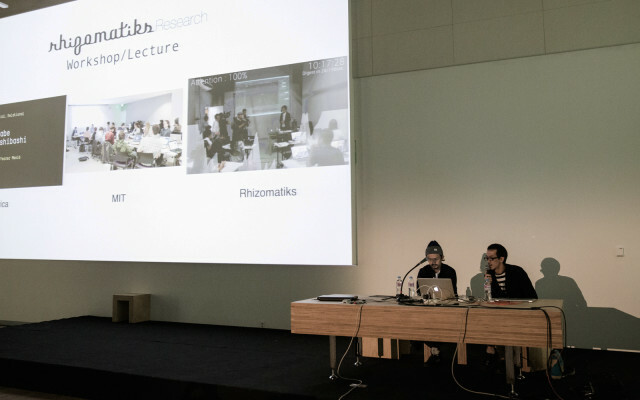 Notably, Watz speculated that “code is a material to be manipulated, with its own artifacts and idiosyncrasies” and – taking advantage of ACT Center’s facilities – he led an intensive workshop that had participants go from learning the basics of 3D printing to coding and outputting generative data sculptures, all within three days. 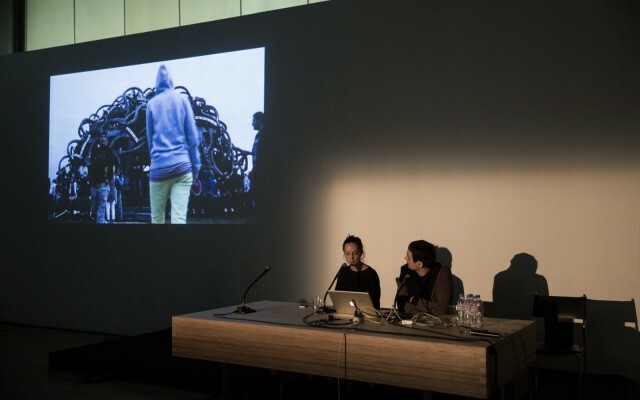 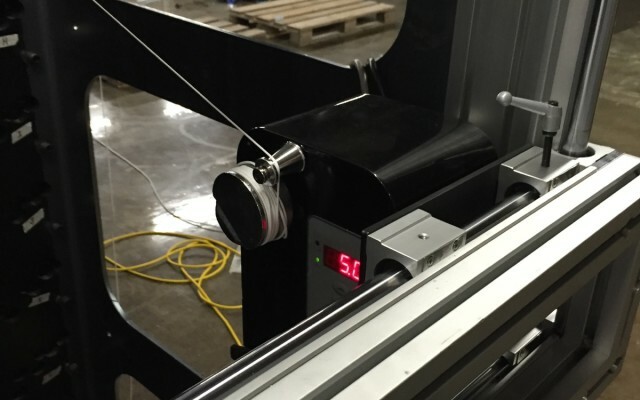 Contemporary practice is equally invested in recontextualizing existing tools as it is as making them from scratch: If the craftsman finds resistance in materials, many artists’ practices are forged in reflections on toolmaking. 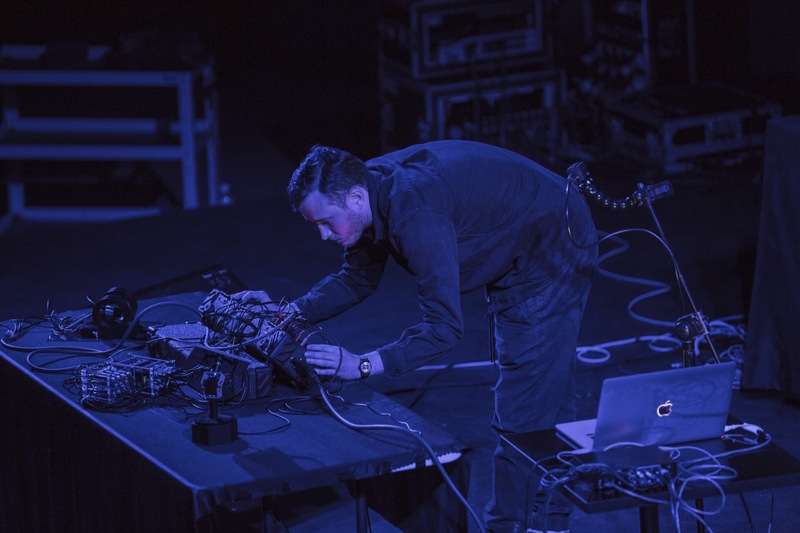 The Instruments of Change session brought together sound-centric practitioners to discuss the creation of musical hardware and devices for both the concert hall and the gallery. 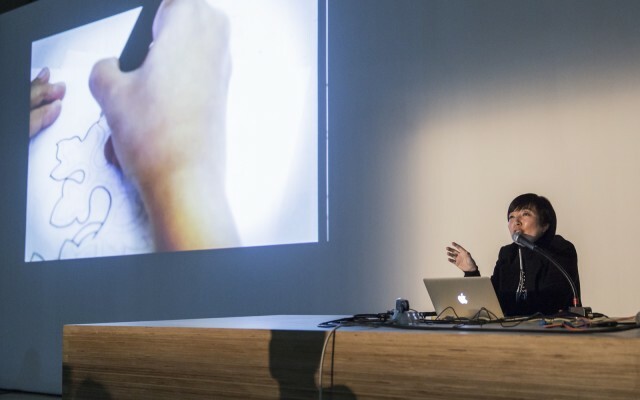 Yuri Suzuki shared a quasi-autobiographical tale of lessons learned from designing bespoke instruments for clients and collaborators ranging from the Japanese inventor/performer troupe Maywa Denki to the Detroit techno legend Jeff Mills, and Myriam Bleau offered a technical and conceptual breakdown her gyroscope-laden tops (aka the Soft Revolvers, which she spun in the performance programme) that function as a multi-channel media player. 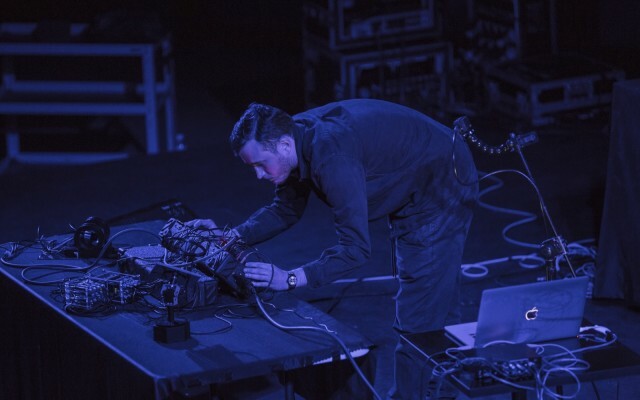 Wildly, Sam Conran channeled everything from Lee Scratch Perry’s use of reverb to iOS system sounds when framing the research around his macrocosmic phenomena-harnessing Kabbalistic Synthesizer. 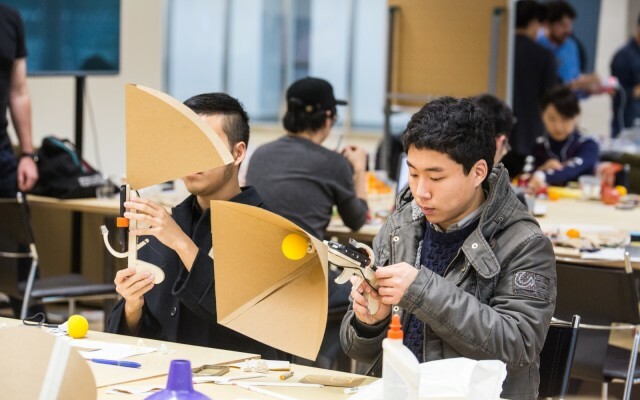 Some related highlights from the workshop offerings: Dooho Yi and Wonjung Shi of Diana Band had a cadre of students rejigger their sensor laden smartphones into ‘sound guns’ with some clever conical prosthetics, Zach Lieberman used code to put an age old medium – drawing – under the microscope, while Elliot Woods and Joanie Lemercier rolled up their sleeves and gutted a few projectors while demonstrating the ‘black and bright’ hack. 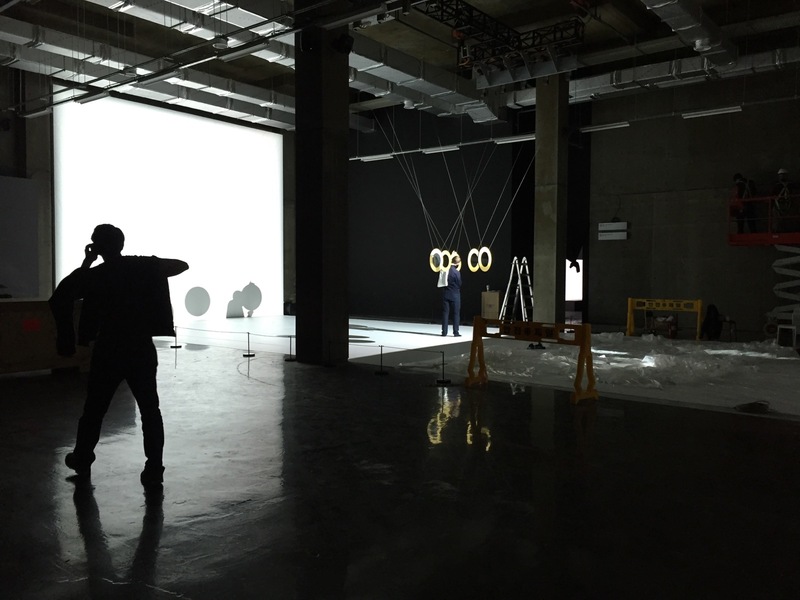 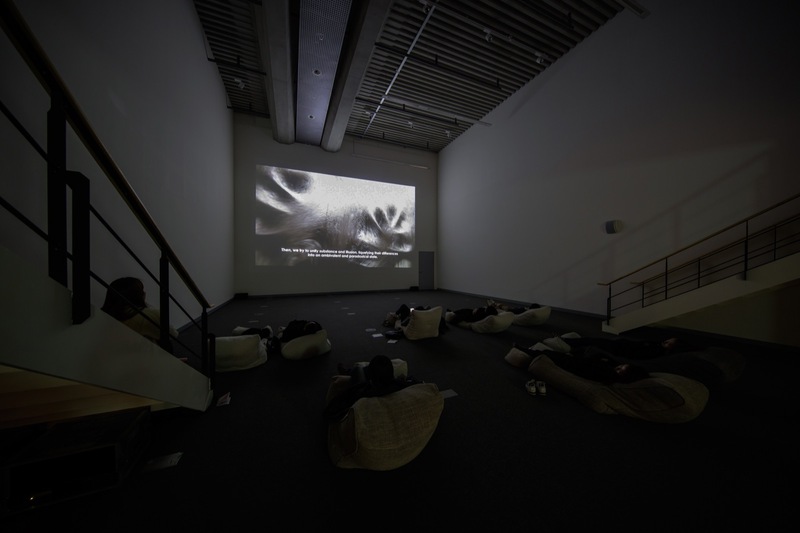 Regardless of its ephemerality or immateriality ‘the digital’ envelops the body: The human body is the most enduring subject in art, but novel mediated experiences can help us see or experience it anew – many of the works showcased at ACT Festival are a testament to that. 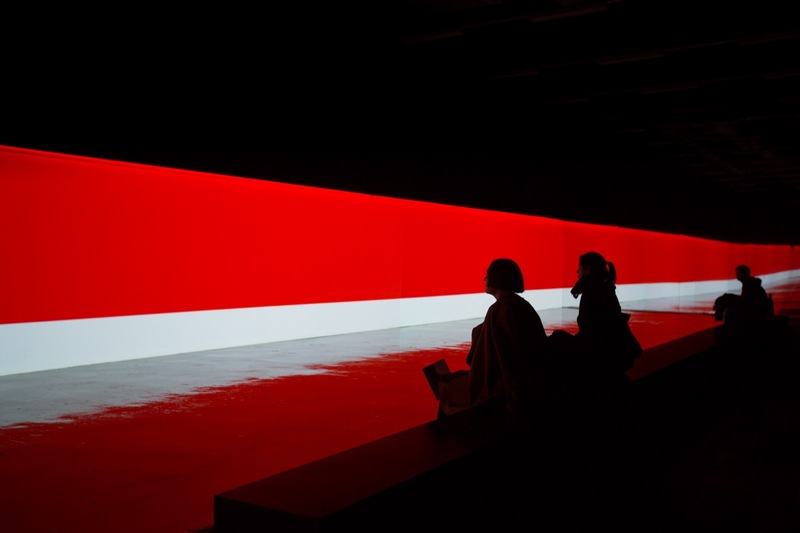 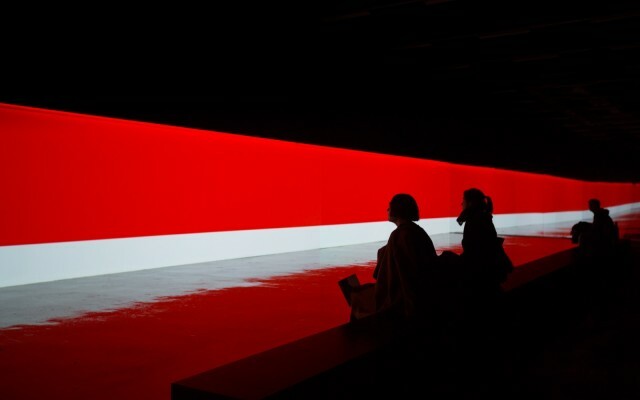 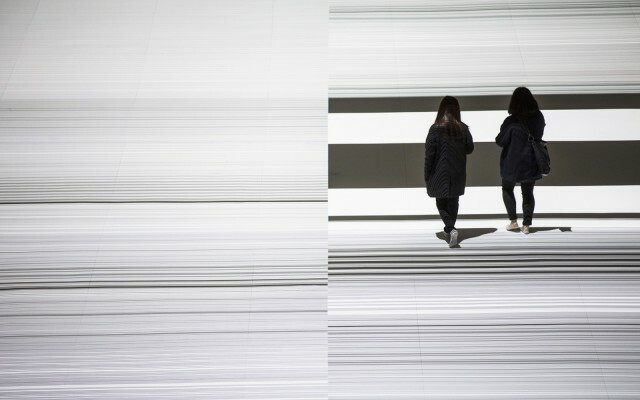 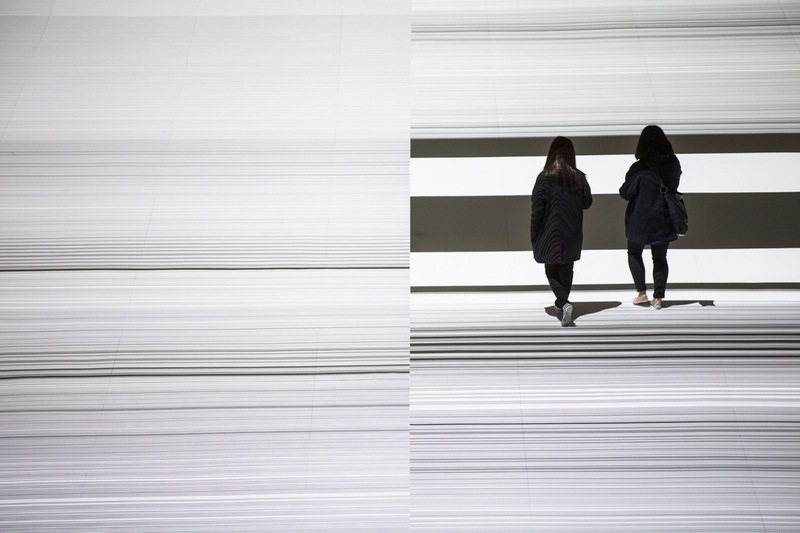 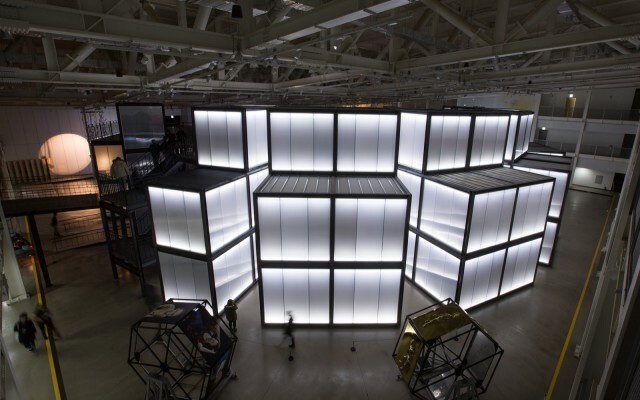 Ryoji Ikeda’s ongoing series test_pattern has filled massive spaces around the world; for ACT, and the eighth iteration of the projection-based work, he took over the 1,300 square metre space The Ground and turned its floor into a stroboscopic datastream. Stream is not hyperbole, visitors who ventured ‘into’ this sprawling and sublime work were required to take their shoes off, and in moving through the piece they resembled loafers strolling along the edge of the sea during low tide. 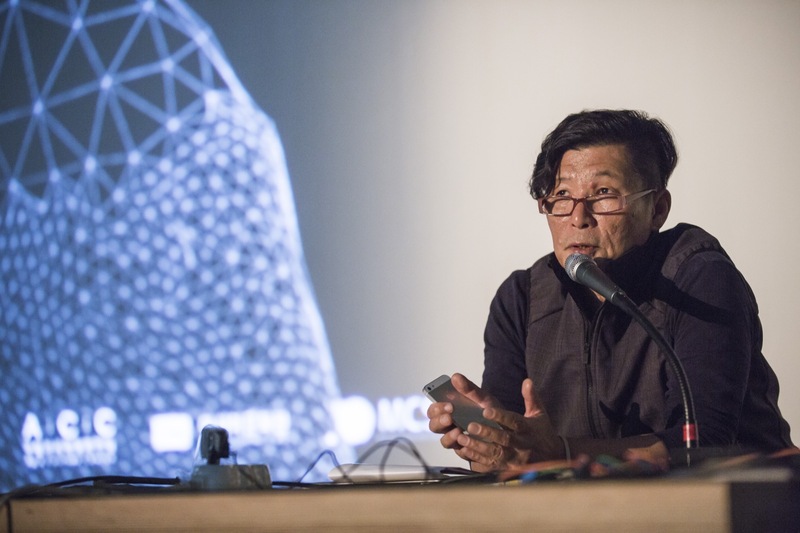 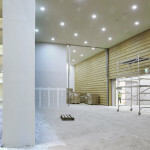 Ikeda’s striated waves were complemented by other considerations of the interplay between the human form and technology. 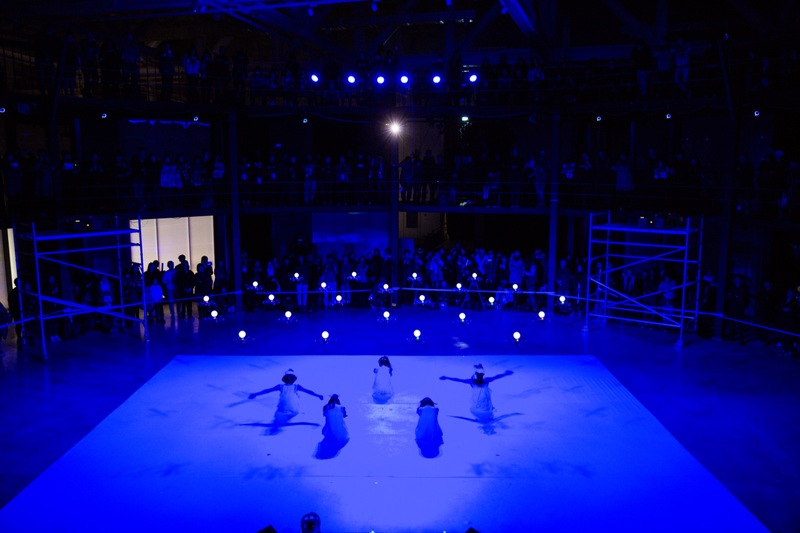 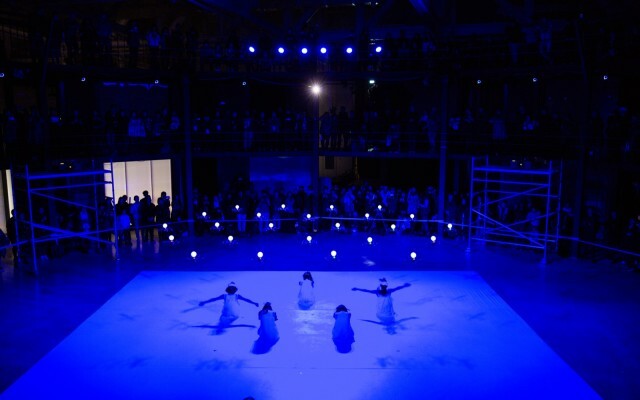 Rhizomatiks dazzled a rapt audience with their most recent collaboration with ELEVENPLAY, which saw five dancers and twenty-four drones weave around one another in a fluid dance routine. 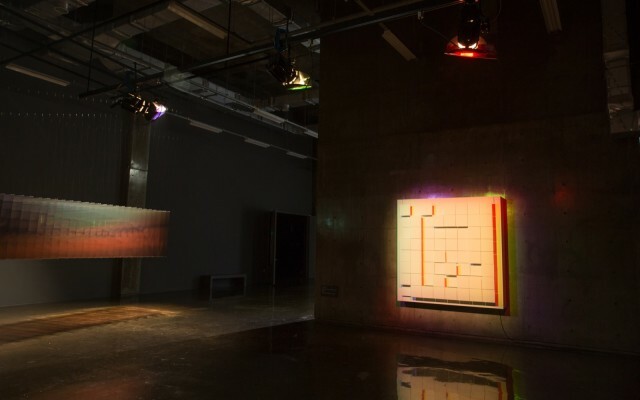 Three pieces from Exonemo’s Body Paint (series) were on display in the exhibition, and on each of its LCD displays video played of a near (but not quite) still painted near-naked person posing with the screen ‘painted’ over around their silhouette yielding nostalgic, twitchy, and unnerving portraits of the mediated body. 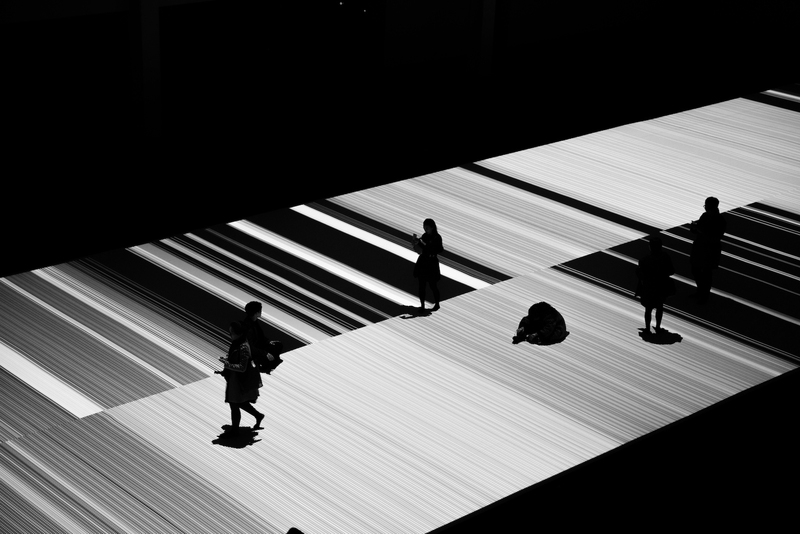 ↑ TL → BR: supercodex / Ryoji Ikeda, CI / Diamond Version, 24 Drones / ELEVENPLAY x Rhizomatiks Research, Blueprint / Joanie Lemercier, syn_ / Ryoichi Kurokawa, syn_ and TACIT Group. 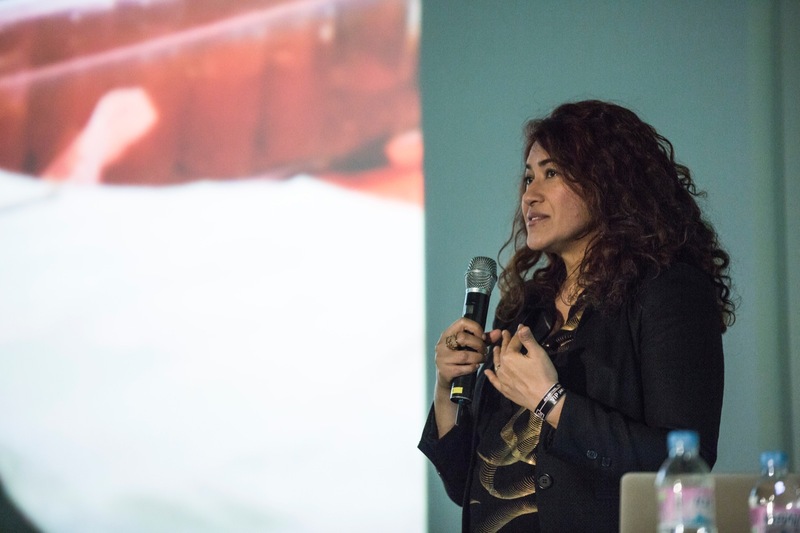 Cultural producers should lead, not follow: ACT Forum brought together a number of international organizations to compare notes, strategy, and tactics. 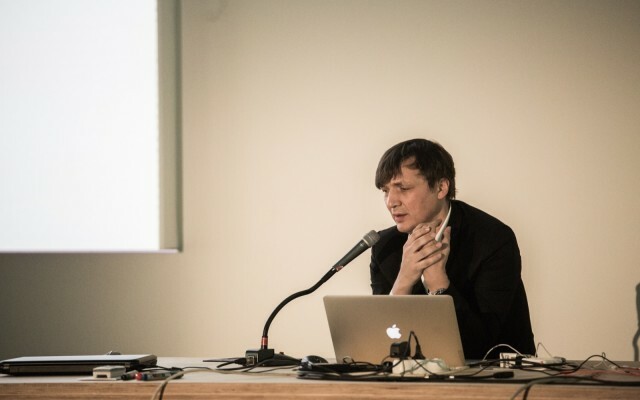 From MIGZ festival, Alexey Shcherbina summarized his last several years developing programming for various museums and events within Russia, including the educational and symposium components of the urban media art-focused “Circle of Light” festival that beams onto Moscow’s facades and public squares each fall. 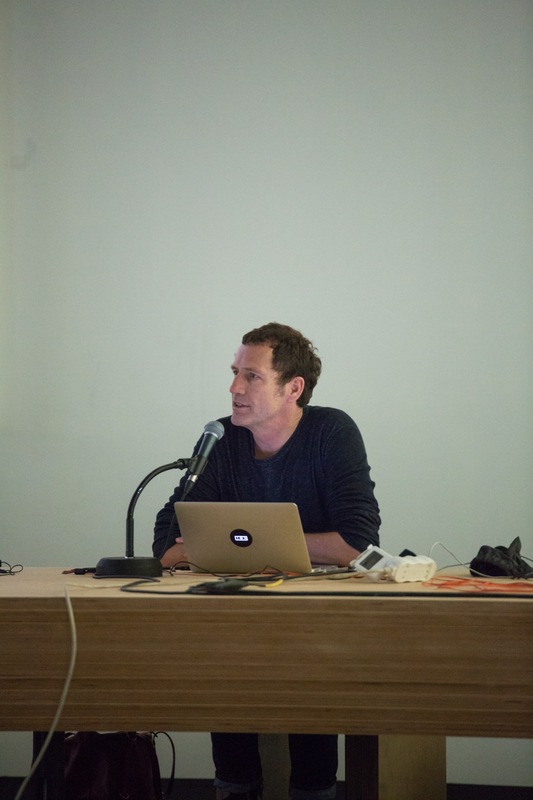 Cédric Huchet of the Stereolux digital art and music hub in Nantes, France discussed his organization’s philosophy (that revealing the process that yields work is as important as its aesthetic) as a driving force within their prolific schedule – which sees them hosts about 200 events and the Scopitone festival each year. 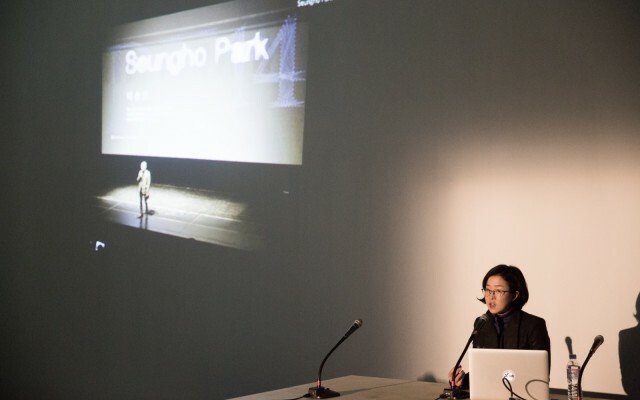 Emiko Ogawa presented on the ‘ecosystem’ of venues, events, and programmes branching out of the Ars Electronica Centre in Linz, which notably included her organization’s partnership in the COLLIDE@CERN program, which puts artists in residence alongside physicists and the Large Hadron Collider in Geneva. 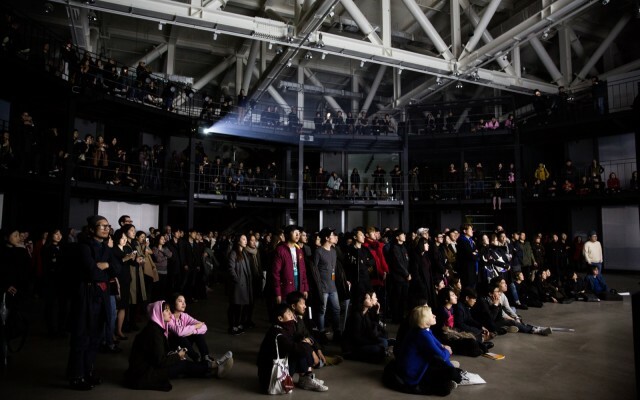 Scaling down from the ‘big picture’ of festivals and museums, artists have a place at the table when it comes to directing cultural conversations – and many of them organize their practices around reconstituting the rules and rituals we live by. 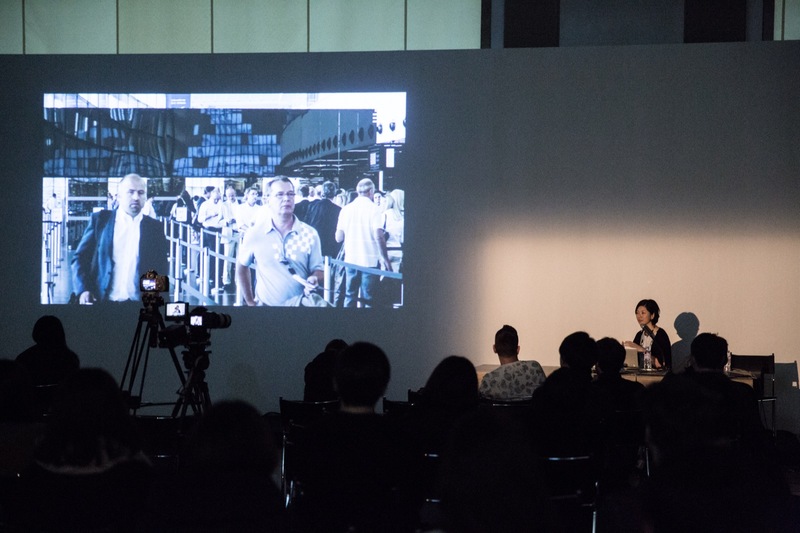 In a related session, Régine Debatty came together with exonemo’s Kensuke Sembo (of Internet Yami-Ichi fame) and Thomas Thwaites (who donned prosthetics to try to ‘pass’ as a goat and fit in with a herd) to discuss how art functions as social commentary and its ability to interface with the political realm. 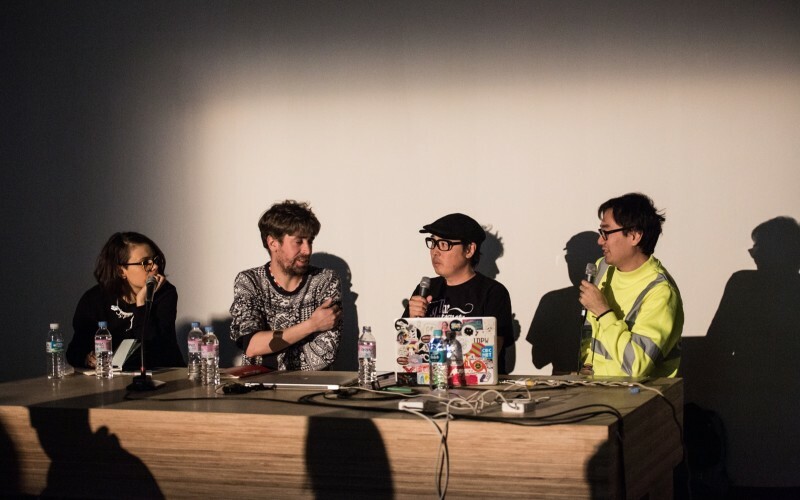 ↑ Top: “Cultural Probes” panel discussion featuring Thomas Thwaites, Kensuke Sembo, Yuri Suzuki and chaired by Régine Debatty in a conversation on ‘art as cultural commentary’. 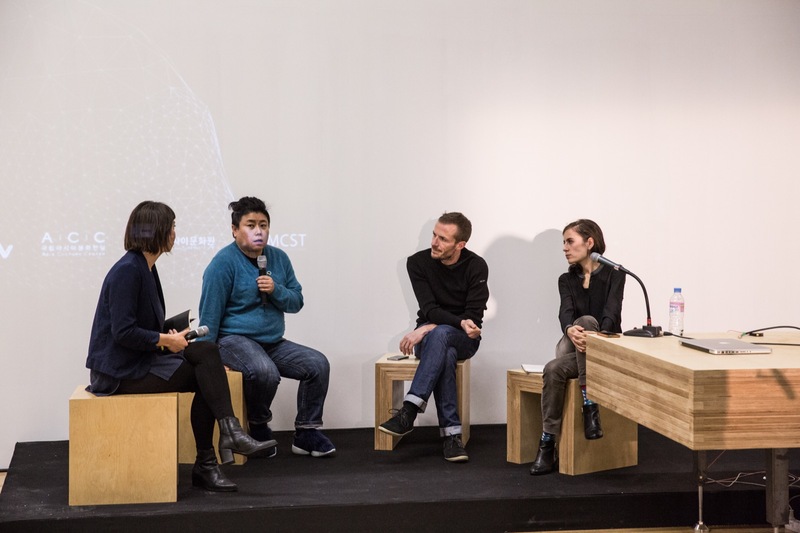 Three: Emiko Ogawa / Ars Electronica, Alexey Shcherbina & Alexandra Berkovich (MIGZ), “Nodes and Networks” panel discussion featuring Ellen Pau, Cédric Huchet, Juliette Bibasse, chaired by Ana Ascencio. 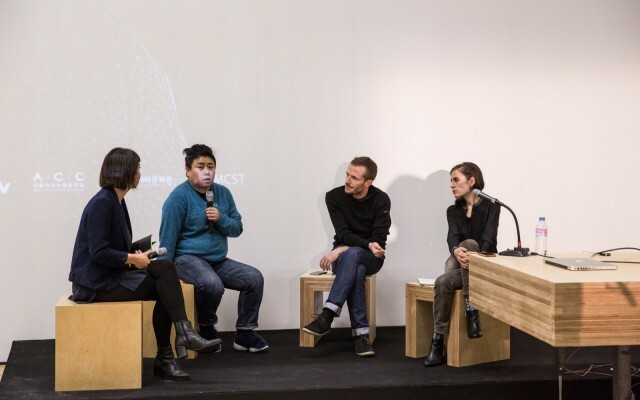 The future leaks into the present: Fittingly, ACT Festival’s final forum session was dedicated to interpreting the future. 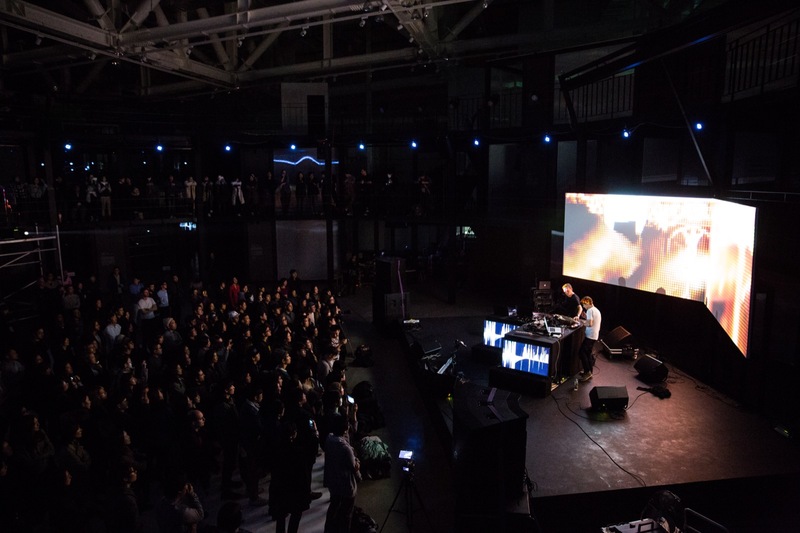 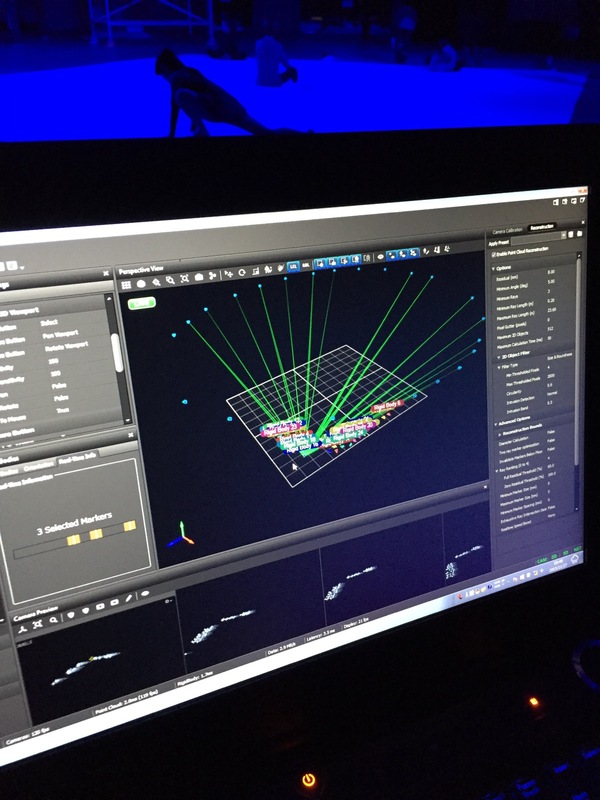 Daito Manabe and Motoi Ishibashi (both ACT Media Art Lab Fellows) of Rhizomatiks revealed some of the process behind their recent motion capture and drone work, masterfully demonstrating how artist/engineer hybrids are uniquely qualified to unlock the expressive potential of emerging technology. 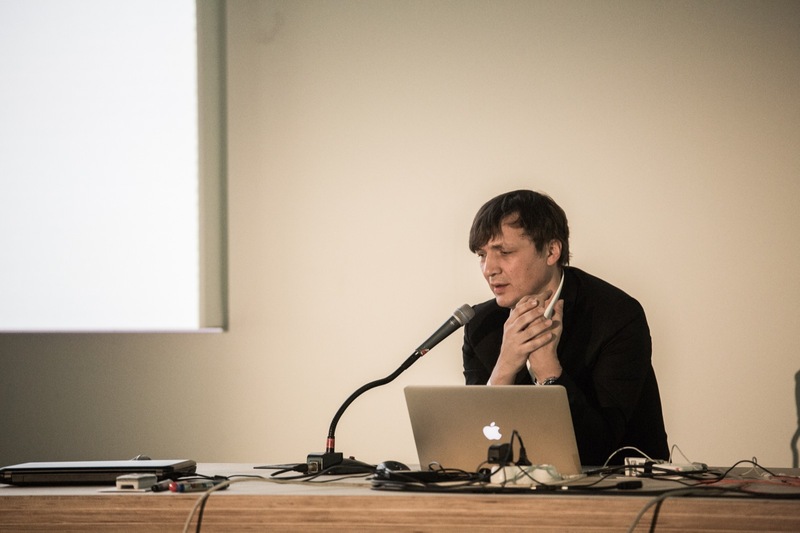 Ivan Poupyrev of Google’s Advanced Technology and Product (ATAP) group made the case for technology ‘disappearing’ and presented a number of ATAP projects focused on “taking touch interaction off-screen and into the world,” including the interactive textiles initiative Project Jacquard and the radar-powered gestural control chip Project Soli. 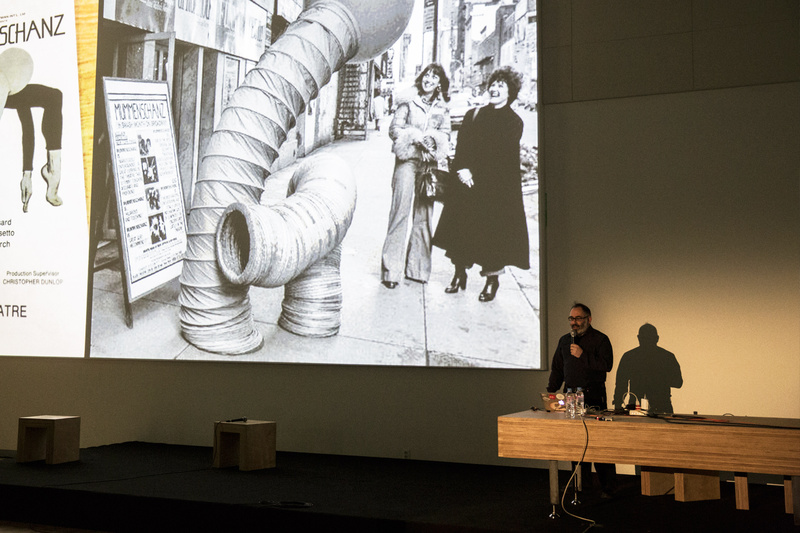 Finally, given the considerable impact the design duo Dunne & Raby (of RCA Design Interactions fame) have had in recent years it was an absolute treat to have Anthony Dunne close out the ACT Festival forum. 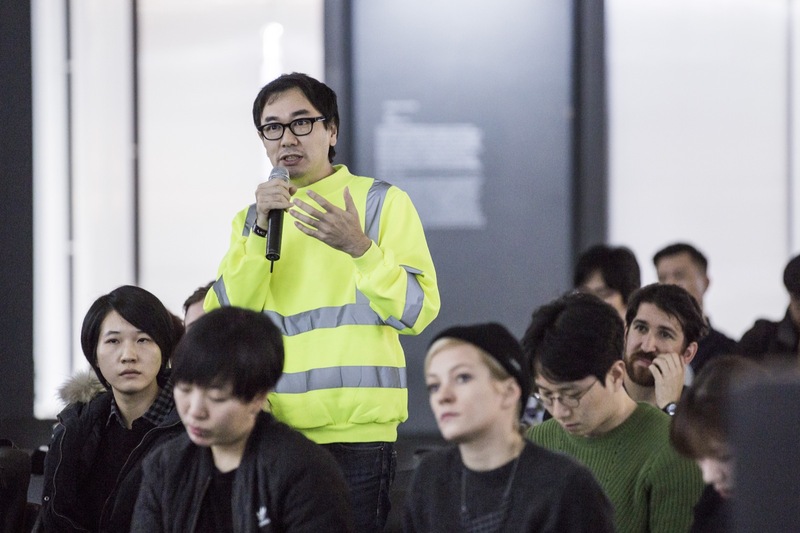 Organized around the rubric “not here, now now” he walked through a number of projects that illustrated design scenarios conceived in relation to utopias, dystopias, counterfactuals, and ‘what ifs,’ including the hyper-libertarian ‘Digitarians’ from United Micro Kingdoms and the The School of Constructed Realities (a fictitious design school), which was presented at the The MAK Design Salon in 2014. 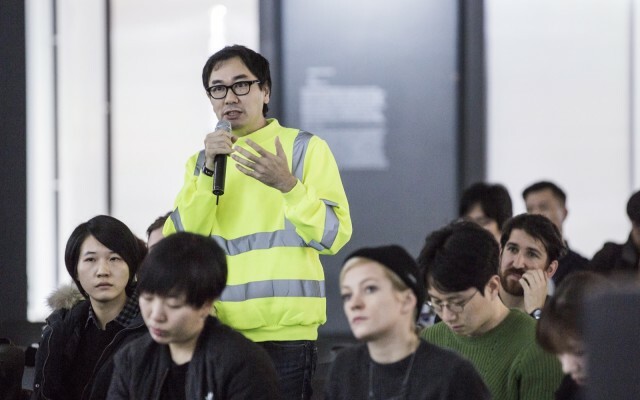 Seeing the Forum wrap-up with two radical visions of the present and a catalogue of erudite possible futures was a perfect finale to the proceedings. 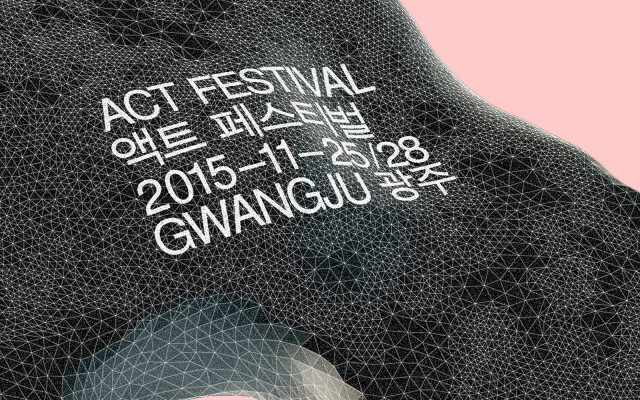 ACT Festival’s future is already coming into view. 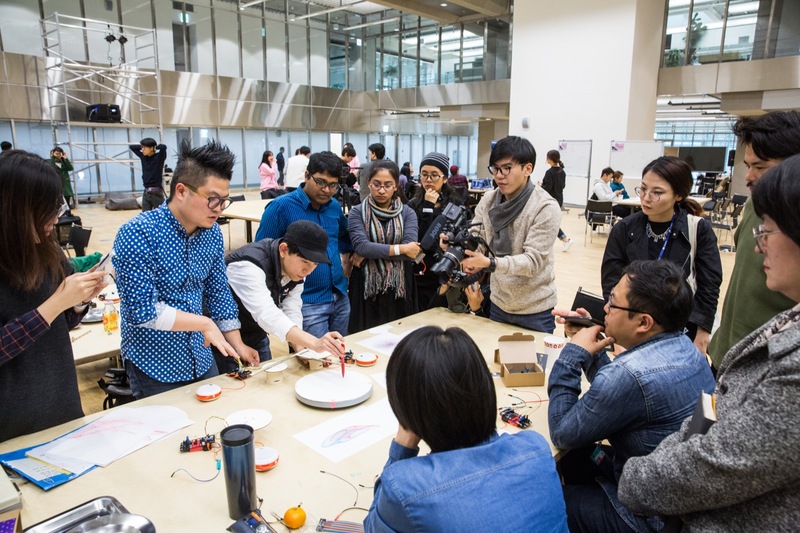 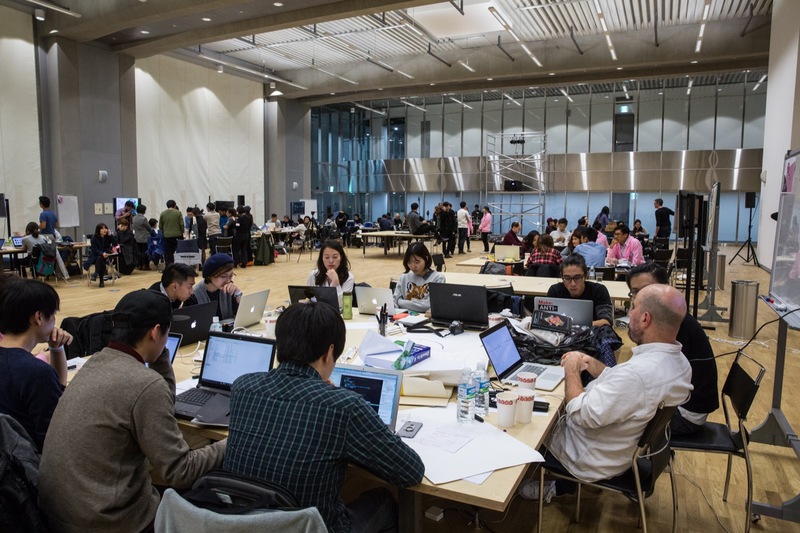 The Center’s 2016 programming will ramp up its focus on its labs and outputs and bolster collaboration with international researchers and the commercial sector. 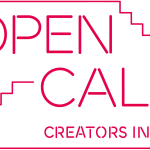 We will share news about residency opportunities in the coming months – and we heartily encourage artists and designers interested in the festival and our activities to apply and get involved. 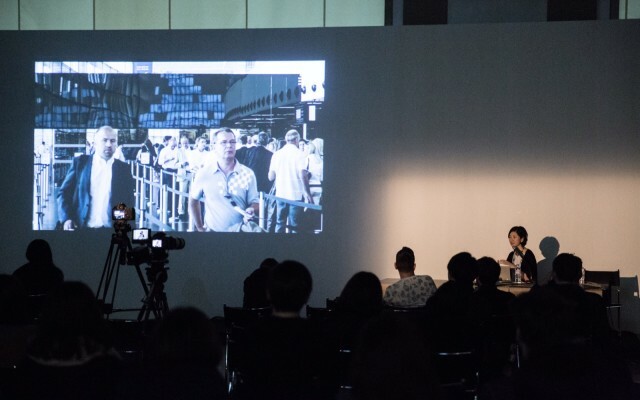 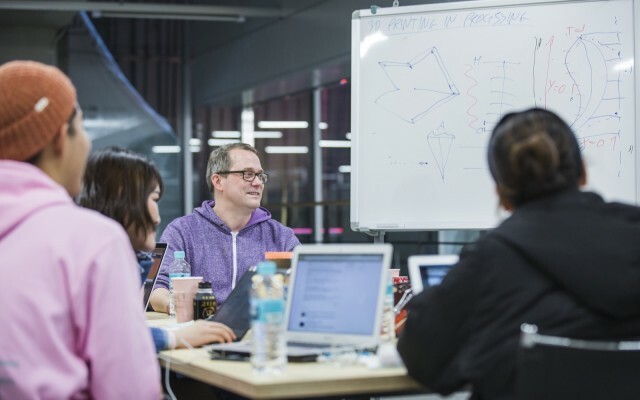 Additionally, ACT Center will be working to develop relationships with like-minded organizations throughout Asia and the rest of the world, ensuring the second edition of the festival will be even more of an international meeting of the minds. 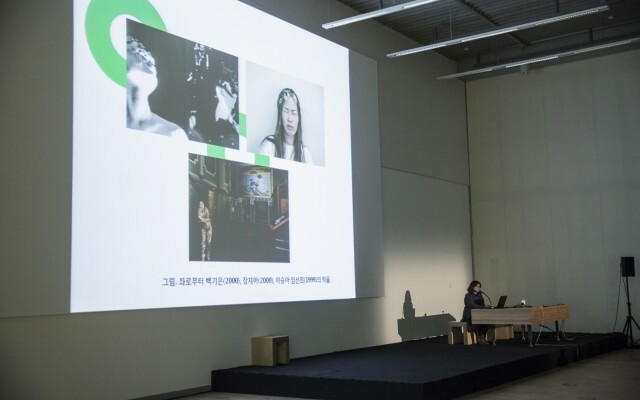 Organised by the ACT Center with support from ACC (Asia Culture Center), Asia Culture Institute, and MCST (Korean Ministry of Culture, Sports and Tourism). 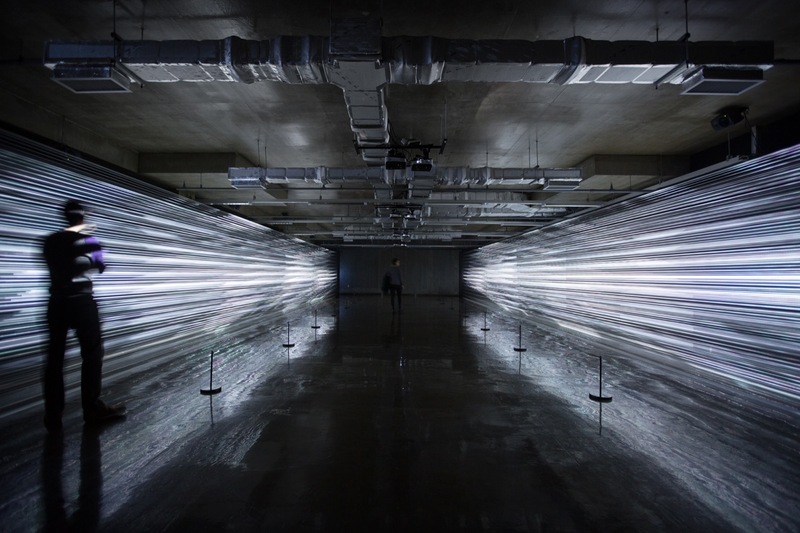 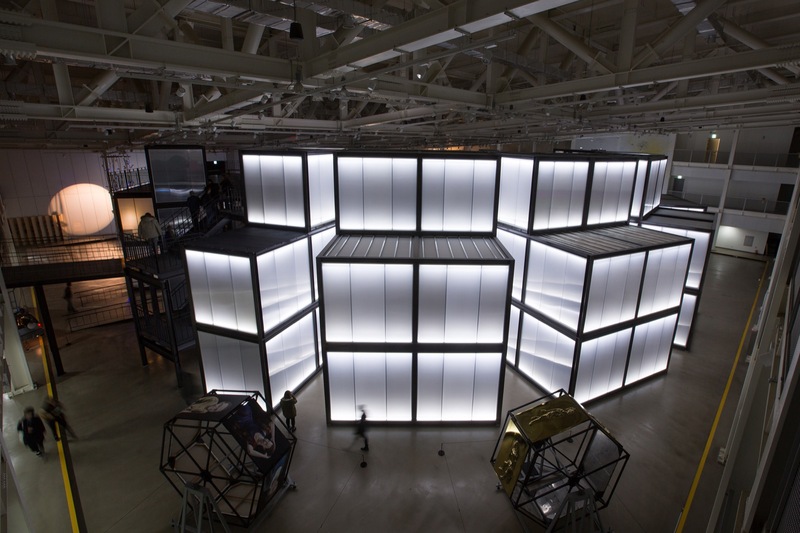 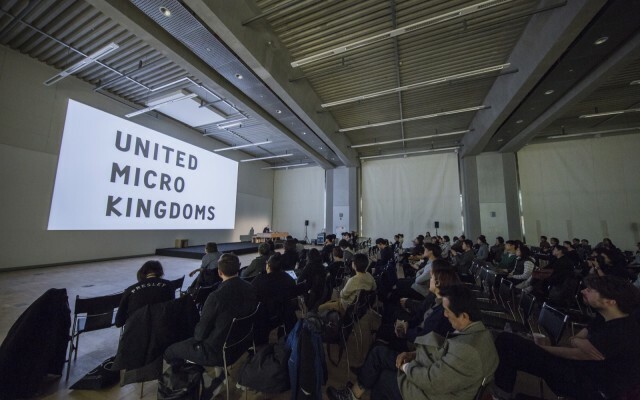 Participating artists: Ryoji Ikeda, Matthew Clark / United Visual Artists, Thomas Thwaites, Joachim Sauter / ART+COM, MIKIKO, Daito Manabe and Motoi Ishibashi / Rhizomatiks, exonemo, Ji Yoon Yang, Klega, Yuri Suzuki, Hearyun Shim, Ryo Ikeshiro, Eunji Cho, Byungjun Kwon, Hoonida Kim and SeungBum Kim / PROTOROOM, Earl Park, Sascha Pohle, Seung Joon Choi, Olaf Bender, Kyong Park, Guenchae Kim, Karsten Schmidt, Wonkon Yi, Jürg Lehni, Emiko Ogawa / Ars Electronica, Hyojung Seo, Christopher Coleman, Cédric Huchet, Marius Watz, Jong Woo Park, Ye Seung Lee, Ivan Poupyrev / Google ATAP, Markus Heckmann / Derivative, Zach Lieberman, Hyunkyung Lee, Yoojin Lee, Alex Rich, Yeunho Kim Jang, Sam Conran, Els Vermang and Manuel Abendroth / LAb[au], Laleh Mehran, Keunbyung Yook, Cathrine Lo, Régine Debatty / We Make Money Not Art, Jihyun Yoon and Sookyun Yang, Myriam Bleau, Seongjae Kim, Youjin Jeon, Jaeho Chang / TACIT Group, Namhee Park, Roel Wouters / Moniker, Joanie Lemercier, Carsten Nicolai, Nobuhiro Nakanishi, Heahyun Cheon, Juliette Bibasse, Golan Levin, Lucia Jiyong Kang, Ilona Gaynor, Ryoichi Kurokawa, Ralf Baecker, Goeun Kwak, Taiyun Kim, Youngho Lee, Wan Lee, Atsuhiro Ito, Ellen Pau, Alain Bellet / ECAL, Yunchul Kim, Elliot Woods and Mimi Son / Kimchi and Chips, Jinwon Lee / TACIT Group, Ana Ascencio / Mapping Festival, Anthony Dunne / Dunne & Raby, Alexandra Berkovich and Alexey Shcherbina / MIGZ, Dooho Yi and Wonjung Shin / Diana Band, Taeyoon Choi, Wonjoon Yoo. 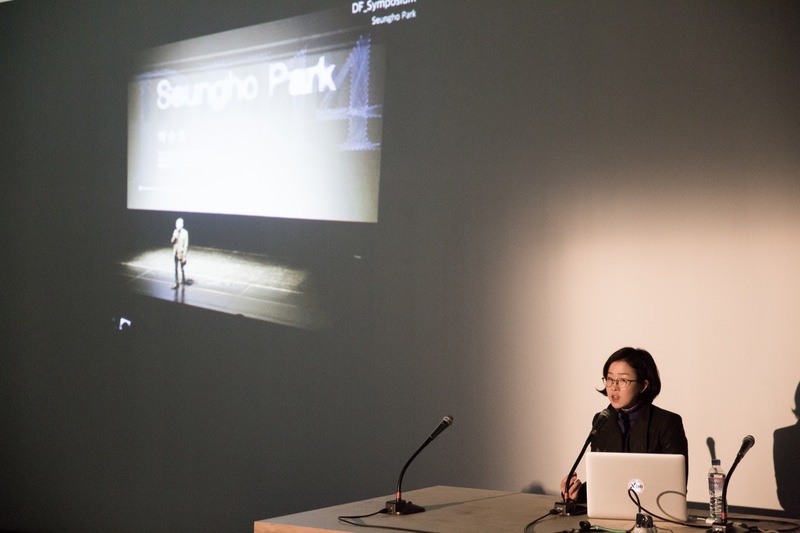 ↑ “Many Moving Parts” session featuring Matthew Clark / United Visual Artists, Els Vermang / LAb[au], Yunchul Kim and Seung Joon Choi. 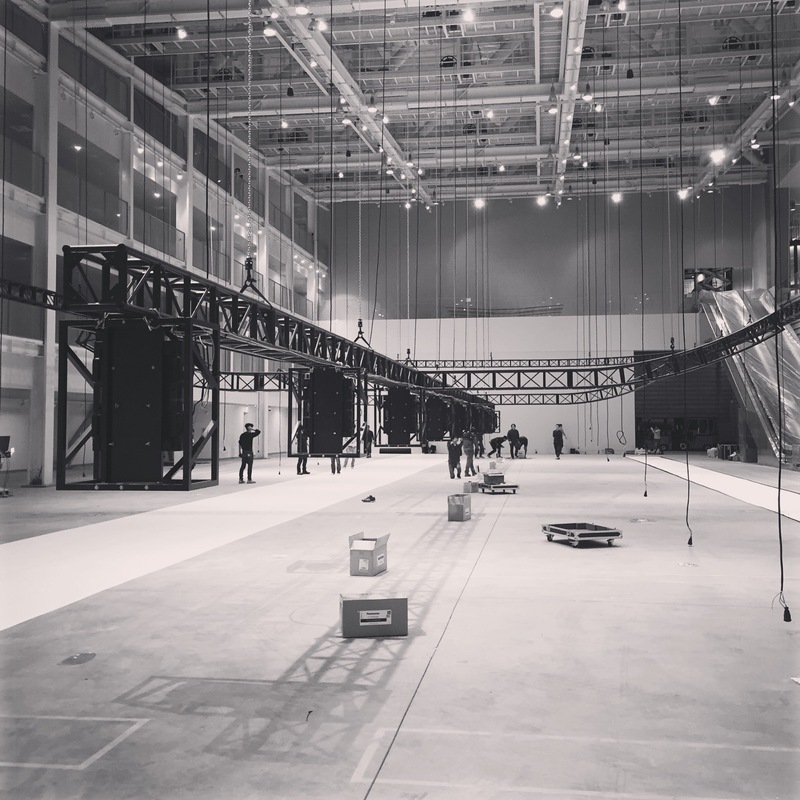 Thanks for all these behind the scenes photos! 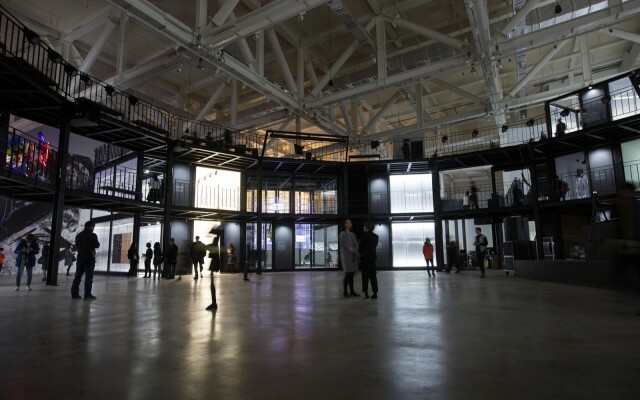 Looks like this was a stellar event in a unique space. 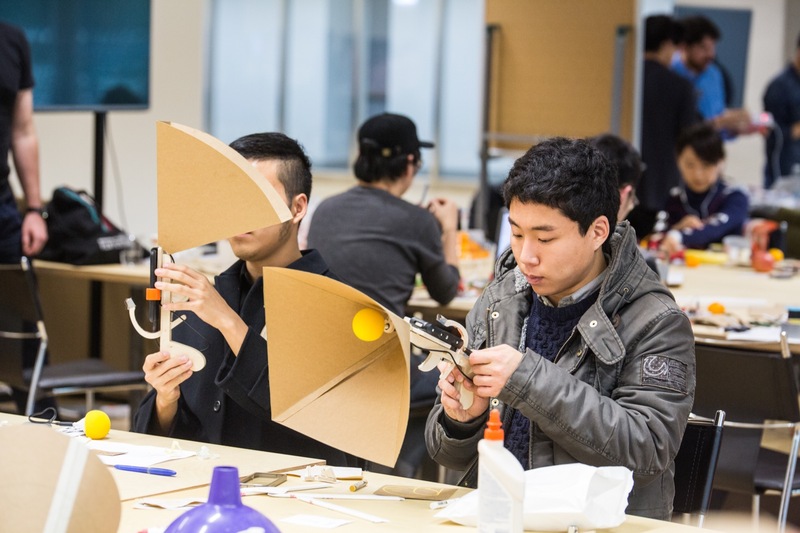 I heard some of the workshops suffered from incredibly-low turnout but honestly, I would’ve enjoyed having a more personable experience with people I’ve been fascinated with since middle school. 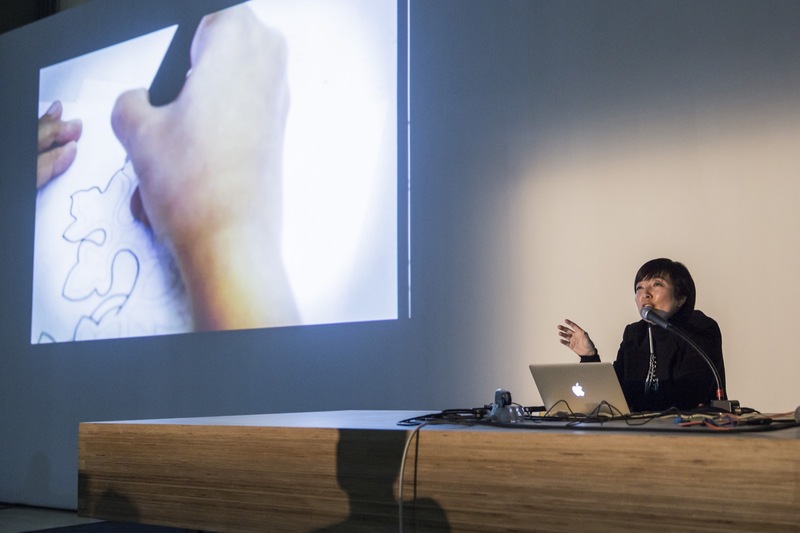 Maybe I could have gotten a few more autographs on my Processing handbook too. 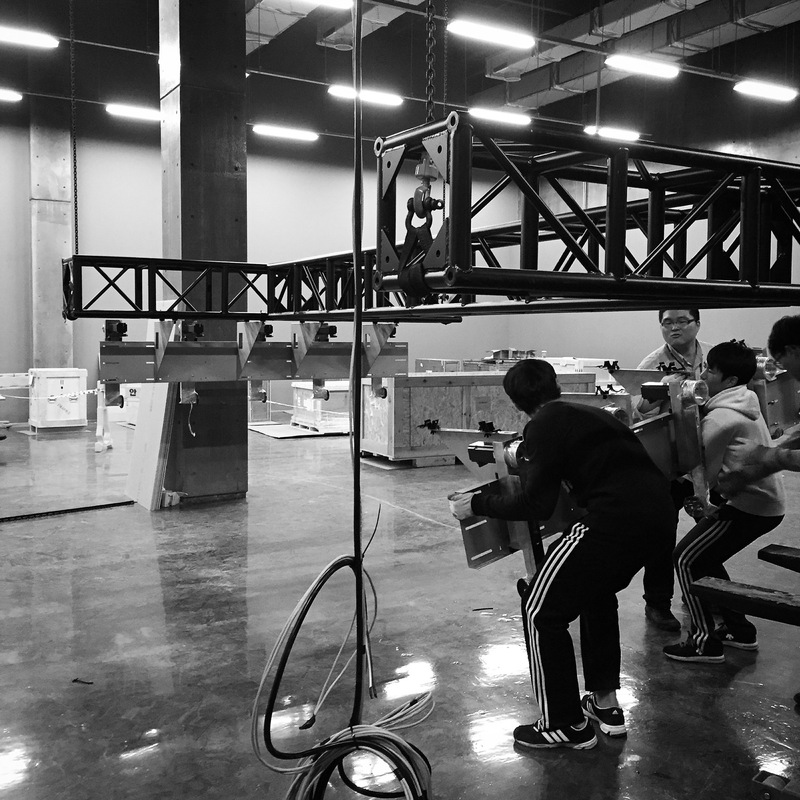 If only South Korea was within driving distance of Texas..